This article will be modified as MAPS 3 voting issues occur. The initial post was made on September 27, 2009; modified and completed on September 29, the 10:24 a.m. with various grammatical corrections after that. As expected, City Council voted about half an hour ago to submit MAPS 3 to a vote of the people on December 8, 2009. The only council member voting NOT to let the people vote on MAPS 3 was Ward 5 council member Brian Walters. In another lengthy article, I tried as well as I was objectively able to present the pros and cons with regard to the on-the-table report of the Core To Shore Steering Committee to contribute to the discussion, and I'll not repeat the content of that article here. In a nutshell, that article presented the Steering Committee's late 2007 report for the purpose of understanding, discernment, and discussion at a time that, presumably, your and my input may have been a factor in shaping the final plan. And, in the MAPS 3 proposal, MAPS 3 is discussed as to it pragmatic content, again, without repetition here. The focus of this article is/are procedural matters/decisions to be made by city council and by you and me, nothing more, nothing less, from this day forward. This article is not involved with your and my possible reasons for favoring or disfavoring MAPS 3 in the final vote. It is strictly related to procedure from this point forward until the vote is cast. The article contains and discusses the ballot and related documents which will be presented for our decision on December 8. Note: I've OCR'ed the documents discussed discussed below (the Ballot, proposed Ordinance, and Resolution, and converted them to text. To read and/or print those documents, click here. Most are also set out below. THE 1ST VOTE: CITY COUNCIL ON SEPTEMBER 29, 2009. The 1st version of this article was written two days before the September 29 council meeting, and the City Council has now decided that MAPS 3 will be submitted for public vote on December 8. Council members Gary Marrs (Ward 1), Pete White (Ward 4), Skip Kelley (Ward 7), Meg Salyer (Ward 6), Sam Bowman (Ward 2), Larry McAtee (Ward 3) and Patrick Ryan (Ward 8) and Mayor Cornett voted Aye. Only J. Brian Walters (Ward 5) voted Nay. Council member Walters wasn't even willing to let the people make their own decision on MAPS 3. So, as promised two days ago, Brian Walters is bestowed the Doug Dawgz Anti-Democracy Award for 2009, hopefully the last time that such a non-prestigious award ever be made. It is fair enough for one to conclude that MAPS 3 should not be passed. Each of us are entitled to form our own opinions about that and cast our votes accordingly. But, WHETHER you and I get to participate in a democratic vote is an entirely different matter. The voters should hold the trump card, not a council member who would want to prevent that from happening. BACKGROUND. City Council voted "Yea" on September 29 to approve matters then pending to submit MAPS 3 items to a vote of the people on December 8. But it comes in a different form than MAPS 1 did and this section attempts to explain why. Oklahoma City's learning curve may have come from a 1986 capital improvements initiative by Mayor Andy Coats. Mayor Coats had described Oklahoma City's situation in bleak terms, and we certainly know that the period was a dark time for Oklahoma City, at least at night if one was downtown. The city was even losing population for the first time within anyone's memory. His "Six To Fix" campaign was an attempt to do something about that — among other things, it would have created a domed stadium at the fairgrounds. "Six To Fix" involved multiple ballots, one per proposed project with each project being voted on separately. The only happy watch parties on the night of June 17 were in the "vote no" camps. 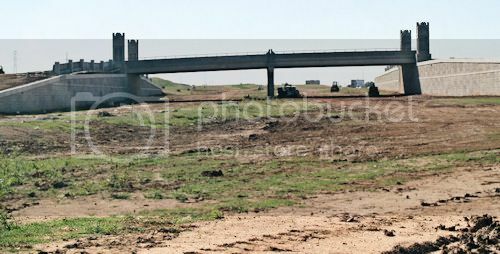 Incomplete returns in the June 18 Oklahoman reflected that only police and fire department elements had been approved and that the big ticket items were substantially defeated. For example, the stadium proposal was failing by a vote of 40,753 to 17,409. With 1993's MAPS, Mayor Norick was determined to take a different tack. Instead of multiple ballots, there would be only one — up or down, all or none. More, it would be the most bold and ambitious tax proposal ever to be submitted to Oklahoma City voters (at least, as far as I'm aware). Steve Lackmeyer and Jack Money's OKC: 2nd Time Around brilliantly and thoroughly describes Mayor Ron Norick's approach and how it succeeded — symphony and arts supporters who wanted upgrades to the Civic Center Music Hall were in common cause and league with sports supporters who wanted a Bricktown Ballpark and Sports Arena, and so on. Each group wound up being a cheerleader for the other. That approach worked and MAPS 1 passed 54% to 46%. While the present MAPS 3 proposal takes the same general approach, there are differences, some perhaps all arising out of legal necessity. Many people might forget that the original MAPS ballot – a list of items to be paid by the tax but with just a "yes for all" or "no for all" vote might be difficult to exactly duplicate today due to a court ruling that came out against such ballots a few years ago. "Legal interpretations of what an Oklahoma ballot should look like have evolved since the original MAPS vote in 1993. Should the Mayor and Council move forward with a MAPS 3 proposal, the process will certainly conform to the operative law, and the City's legal office will be exploring those issues as appropriate. It would be our intention to stay close to the basic model the voters have shown themselves to be comfortable with." During a meeting I had on September 28 with David Holt, Mayor Cornett's Chief of Staff (which will be more particularly described in this related article on the actual Maps 3 Proposal), he was able to give me some leads pertaining to the legal issue alluded to above. I have no intention of making an in-depth study of the legal issues involved here — in the 1st place, I have no expertise in this area of the law, and, in the 2nd, legal issues are not what this article is about, even if I did. But I did peruse the case of Fent v. State ex Rel. Oklahoma Capitol Improvement Authority, a 2009 Oklahoma Supreme Court Decision, as well as some of the references mentioned in that case, and I am more than reasonably satisfied that a ballot like that contained in original MAPS would not likely withstand legal challenge today — at the least, I take and accept that conclusion as a given. ¶14 Art. 5, §57 of the Oklahoma Constitution provides: "Every act of the Legislature shall express but one subject, which shall be clearly expressed in its title. . . ." This provision is commonly known as the "single subject rule." The purposes of the single subject rule are: 1) to ensure that the legislators or voters of Oklahoma are adequately notified of the potential effect of the legislation; and 2) to prevent "logrolling," the practice of assuring the passage of a law by creating one choice in which a legislator or voter is forced to assent to an unfavorable provision to secure passage of a favorable one, or conversely, forced to vote against a favorable provision to ensure that an unfavorable provision is not enacted. The single subject rule applies to legislative acts promulgated through the initiative process, as well as those promulgated through the Legislature. Every act enacted by the Legislature, and every ordinance and resolution passed by any county, city, town, or municipal board or local legislative body, levying a tax shall specify distinctly the purpose for which said tax is levied, and no tax levied and collected for one purpose shall ever be devoted to another purpose. As a practical matter, the bottom line is that the city would likely have followed the original MAPS model if it thought that it could do so, given that model's history of success in our city. So, while the 1993 MAPS ballot was long and detailed, each item being particularly identified, the 2009 MAPS 3 ballot reads quite differently. Below is a hard-to-read version of the 1993 MAPS ballot, followed by the ballot MAPS 3. 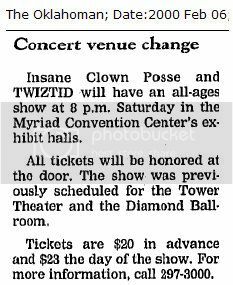 The image below is from the December 13, 1993, Oklahoman. Click on the graphic for a more readable version. The Proposed Ordinance. The above ballot is only a snapshot, a brief summary, of the much lengthier proposed ordinance No. 23,942. The Ordinance [No. 23,942] defines the term "City capital improvement." 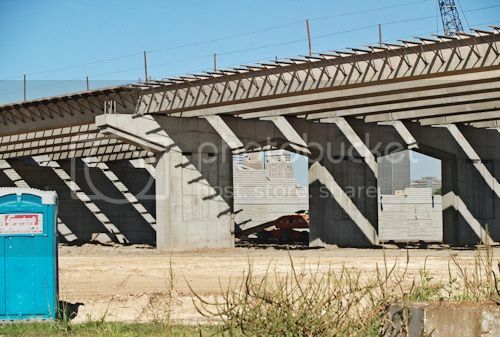 The Ordinance states expenditures to provide City capital improvements may include expenditures for any or all items(s), article(s), cost(s), or expense(s) related in any way to providing a City capital improvement. 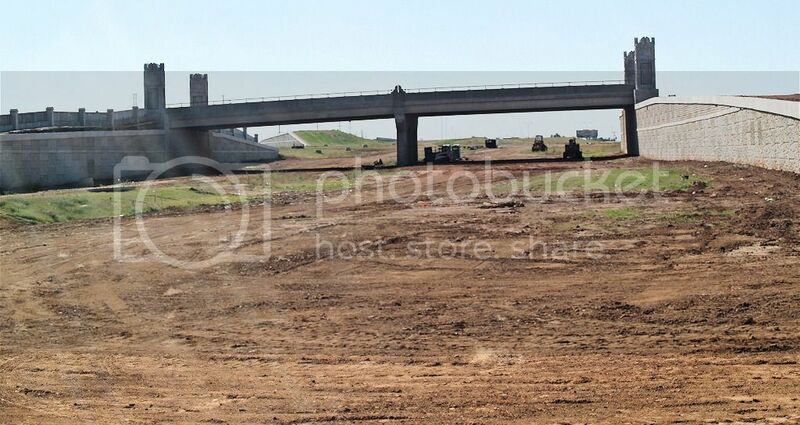 The Ordinance creates the "Oklahoma City Capital Improvements Sales Tax Fund." § 52-23.4. Excise tax on gross receipts for funding City capital improvements. 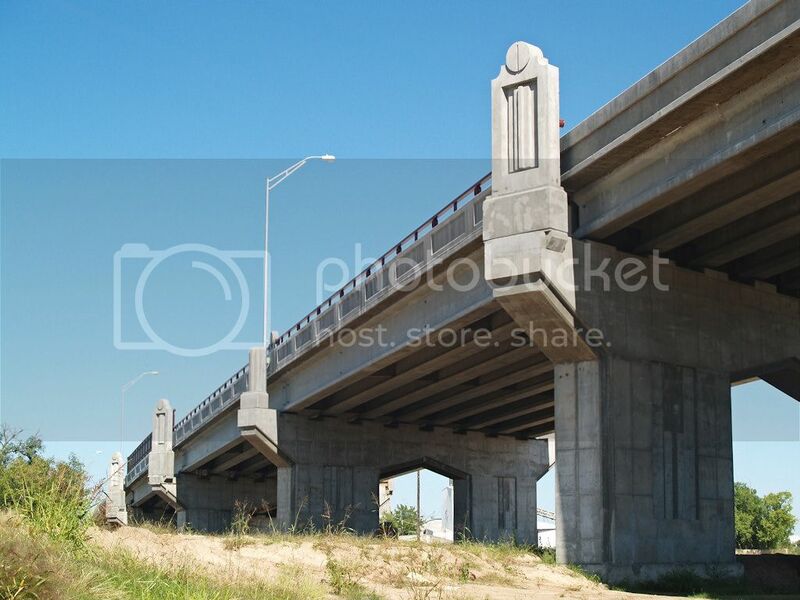 (3) Any other type of beneficial or valuable change or addition, betterment, enhancement, or amelioration of or upon any real property, or any interest therein or appurtenances thereto, belonging to the City, intended to enhance its value, beauty, or utility or to adapt it to new or further purposes. (7) If deemed necessary or appropriate by the City Council for cash-flow purposes, for the payment of principal and interest on and the costs of issuance of bonds, notes, lines-of-credit, or other evidences of indebtedness issued by a public trust with the City as its beneficiary for the purpose of providing a City capital improvement. (e) Pursuant to authority of 68 O.S. 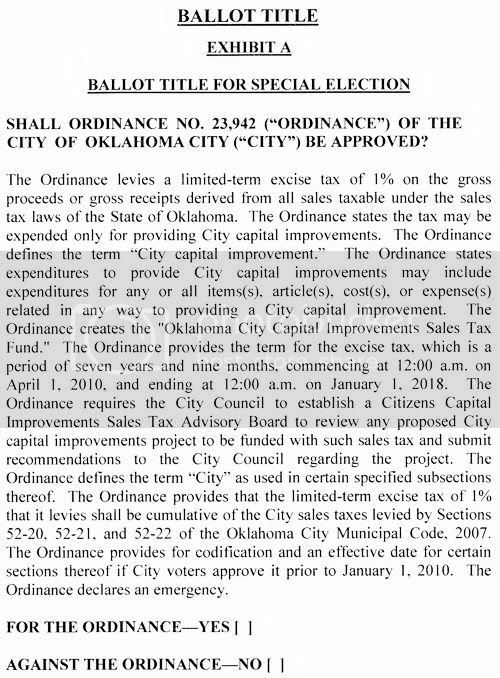 § 2701(B), there is hereby created a limited-purpose fund to be known as the "Oklahoma City Capital Improvements Sales Tax Fund" (hereinafter the "Fund") into which all revenues collected pursuant to Subsection 52-23.4(a) above shall be deposited. Money in the Fund shall be accumulated from year-to-year. The Fund shall be placed in an insured interest-bearing account and the interest that accumulates on the Fund shall be retained in the Fund. The Fund shall be non-fiscal and shall not be considered in computing any levy when the City makes its estimate to the Excise Board for needed appropriations. Money in the Fund shall be expended only as accumulated and only for the limited-purpose specified in Subsection 52-23.4(b) above. (f) The excise tax levied pursuant to Subsection 52-23.4(a) above shall be for a limited term of seven years and nine months, beginning at 12.00 a.m. on April 1, 2010, and ending at 12:00 a.m. on January 1, 2018. (g) For the purpose of advising the City Council regarding projects proposed for funding from the excise tax levied by this section, the City Council shall by resolution establish a Citizens Capital Improvements Sales Tax Advisory Board. The Board's function shall be to review any such proposed project and submit recommendations to the City Council regarding the project. Without more, and assuming the legal validity of both the ballot and the ordinance, passage of the ordinance would give the city carte blanch authority to apply and utilize the $777 million projected to be received via the MAPS 3 vote in any way that it might occasionally decide by adopting a new Resolution which modified the first. As long as the definition of "City capital improvement" was satisfied, it would be within the city council's power to do that. 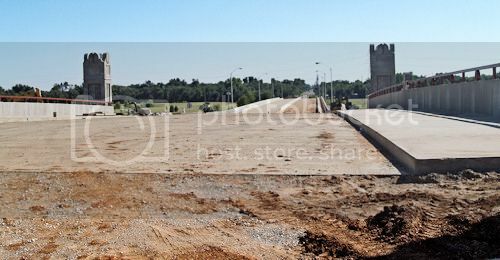 Given that I am such a fan of Oklahoma City, the city might well decide to honor that fact by using an itty-bitty piece of that $777 million by constructing a very cool public swimming pool in Mesta Park, just two blocks west of where I live! Way Cool! But, no, you wouldn't like that, would you? You would want the $777 million to be expended for the items explicitly outlined by the mayor and council in the MAPS 3 overall proposal. And so would I (the possible exception being the cool pool in Mesta Park). So where's the safeguard that the $777 million will actually be expended for the explicit purposes that the city tells us the money will be spent to construct? SAFEGUARDS. Actually, there are two: (1) a Citizens Capital Improvements Sales Tax Advisory Board; and (2) the resolution which accompanies the other documents. As is plain from the language, the advisory board has no power of decision. Its functions are limited to (a) review and (b) recommendation. It might be a good thing to have an Eric Groves and/or a Kirk Humphreys type of guy on this committee, I'm thinking. But, that's just me. The Accompanying Resolution. Taking it as a 1st given that the MAPS 3 ballot and ordinance may not be the "logrolling" type discussed above, and taking it as a 2nd given that the city still opts for the general collective "up or down" approach of the original MAPS championed by Mayor Ron Norick, what's a mother city to do? The 1986 "Six to Fix" item-by-item campaign was, substantially, a disaster. Conversely, the 1993 MAPS initiative take-it-or-leave-it all-or-none approach turned out to accomplish a true and non-debatable miracle for our city. How can the original MAPS approach be duplicated today given the legal constraints discussed above? Put differently, is there a way around the "logrolling" legal problem discussed above? Maybe. Possible legal challenges will ultimately answer the above question. But, for now, the city has put together a logrolling work-around (1) by crafting a general ordinance which identifies no particular project but only defines the term, "City capital improvement," and (2) by crafting a simultaneous City Council Resolution which commits the city to utilizing the MAPS 3 tax receipts for the purposes which have been publicly identified in the overall MAPS 3 proposal, those projects being identified in the Resolution. My guess, given the existence of what some might call ombudsmen like Jerry Fent (who has been involved in at least 26 Oklahoma Supreme Court cases as a taxpayer litigant that I could quickly locate), is that if MAPS 3 passes it will face immediate legal challenge before the Oklahoma Supreme Court. I offer no outcome prediction should that occur, but it would be foolhardy not to anticipate and expect that such challenge, given what I've already said above, would be made. RESOLUTION SETTING FORTH THE PRESENT INTENT AND RESOLVE OF THE CITY COUNCIL OF THE CITY OF OKLAHOMA CITY REGARDING THE "MAPS 3 PROGRAM" TO BE FUNDED WITH THE "OKLAHOMA CITY CAPITAL IMPROVEMENTS SALES TAX" LEVIED PURSUANT TO SECTION 52-23.4 OF ARTICLE II OF CHAPTER 52 OF THE OKLAHOMA CITY MUNICIPAL CODE, 2007; STATING THE COUNCIL'S INTENT AND RESOLVE REGARDING THE CITY CAPITAL IMPROVEMENT PROJECTS TO BE INCLUDED IN THE MAPS 3 PROGRAM; AND DIRECTING THE CITY MANAGER TO TAKE ALL NECESSARY ADMINISTRATIVE ACTIONS TO IMPLEMENT THE MAPS 3 PROGRAM UPON APPROVAL OF THE OKLAHOMA CITY CAPITAL IMPROVEMENTS SALES TAX LEVY BY CITY VOTERS ON DECEMBER 8, 2009. WHEREAS, the details regarding the City capital improvement projects included in the MAPS 3 Program shall, at appropriate times in the future, be determined by the City Council following recommendations regarding said projects to be submitted to the City Council by the "Citizens Capital Improvements Sales Tax Advisory Board," as required by Ordinance No. 23,942. NOW THEREFORE, BE IT RESOLVED that the City Council of The City of Oklahoma City does hereby express its present intent and resolve to use the revenues generated by the Oklahoma City Capital Improvements Sales Tax to fund the MAPS 3 Program, with the City capital improvement projects to be included in the MAPS 3 Program listed on Exhibit A attached to this Resolution. 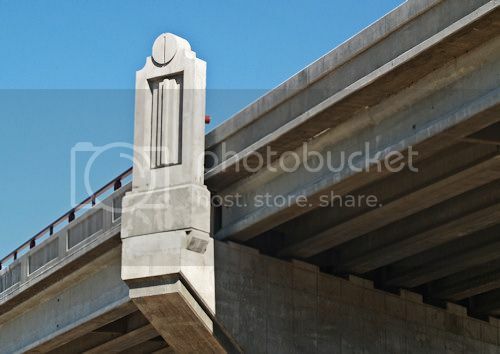 AND BE IT FURTHER RESOLVED that the details regarding the City capital improvement projects included in the MAPS 3 Program shall, at appropriate times in the future, be determined by the City Council following recommendations regarding said projects to be submitted to the City Council by the Citizens Capital Improvements Sales Tax Advisory Board, as required by Ordinance No. 23,942. AND BE IT FURTHER RESOLVED that the MAPS 3 Program shall be subject to the provisions of Section 38-488 of the Oklahoma City Municipal Code, 2007, relating to the budgeting of public funds for works of art and for the selection and placement of works of art upon property owned by the City. 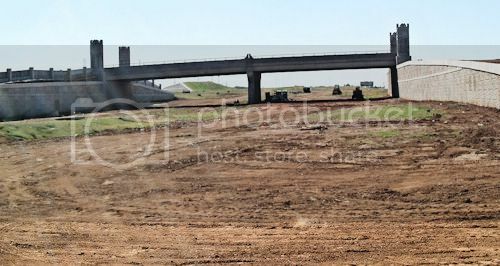 AND BE IT FURTHER RESOLVED that the City Manager of The City of Oklahoma City is directed to take all necessary administrative actions to implement the MAPS 3 Program upon approval of the Oklahoma City Capital Improvements Sales Tax levy by City voters on December 8, 2009. I guess you caught that "present intent and resolve" part, right? Put differently, City Council could, should it wish, change, delete, substitute, abandon, each and every item contained in Exhibit A which follows, and it would be completely legal. The Resolution could have been made a little tougher by including a requirement that a generous supply of tar and feathers be made publicly available and accessible at all times, should Council unwisely make such a choice. A new large, downtown public park linking the core of downtown with the Oklahoma River, with the park to be generally in accordance with the Core To Shore framework plan. A new rail-based streetcar system to service the inner city and/or to service other areas within The City of Oklahoma City, plus funding for other transit infrastructure as appropriate, such as connections to other rail-based systems and/or a transit hub. A new downtown convention center, to include exhibit halls, meeting rooms, ballrooms, mixed uses, and parking. A series of strategically-placed sidewalks on arterial streets and near public use facilities within The City of Oklahoma City. Improvements and/or enhancements to the Oklahoma City public trails system. 2) New grandstands and other rowing venue enhancements. New health, wellness, and aquatic centers designed for senior citizens. Improvements and/or enhancements to the Oklahoma State Fairgrounds. CONCLUSION. In a nutshell, the method described above places a great deal, a very great deal, of public trust in the City Council and Advisory Board, not just this year or the next but during the entire span of 7 years and 9 months time. Members of council will come and go before the time fully passes. Should the citizenry decide to pass MAPS 3, we actually don't want the city to decide, later, to chuck parts of MAPS 3 which are being sold to us today, do we. That's a rhetorical question. While I would have preferred a "long ballot" with all of the projects identified in it with an all-or-nothing vote like MAPS 1 was, since "logrolling" is apparently no longer legally allowed, that was not a possibility. I'm willing to take the risk and do the handshake deal, but I also think that we should make sure that the supply of tar and feathers isn't allowed to get too cold, should they become needed — that, and get an Eric Groves and a Kirk Humphreys on the Advisory Board, as well. Fair enough? Fair enough. That's pretty much all there is to say unless I think of something to add later. 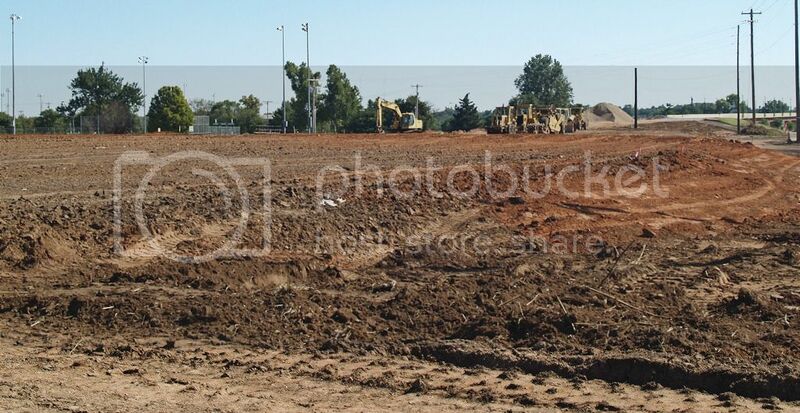 Psst ... Wanna See Some Dirty Pictures? It's been much too heavy lately focusing in on MAPS 3 lately and it was high time for a break. My head has been hurting — I'm not fond of doing political posts and taking issue with city leaders that I like and admire. I needed a break. I accepted the sign's invitation and by doing so I became one of the first drivers on the new I-40 crosstown. Yes, I did have my camera in hand. Come along for the ride, if you want. A STREET SIGN sign is talking to me? Sure, why not — I've seen (and enjoyed) the movie L.A. Story so I already knew that road signs are capable of having personalities and, sometimes, even wisdom, musical and magical capabilities — even if this sign was puny by comparison to the L.A. Story sign. No disrespect intended, Reno/Penn sign, but you're young yet and, after all, you didn't play Do Wah Diddy, did you? The Southsiders group met yesterday afternoon at Coits at 2500 S. Western, and I was there. After the meeting, Generals 64 (I call him Bob) led me and Prunepicker to the remnants of the "Sandtown" community — a poverty stricken but proud area during the Great Depression and later — it was located around May Avenue and the North Canadian River. Bob had already showed me where the huge Phillips gas plant was located in far south Oklahoma City, a very big deal in the 1930s and 1940s (which will be the subject of a Trains article whenever I get around to it) and where the 1st Oklahoma City canal was located (well, not exactly — but it was a heck of an interesting story — see this earlier article about that). Seeing the Sandtown remnant, I proceeded east on Reno toward my Mesta Park home. That's when I encountered the sign at Reno & Penn, and, as I said, I accepted the sign's invitation to "Come On In." Here's what I saw. In the following, click on an image for a larger view. 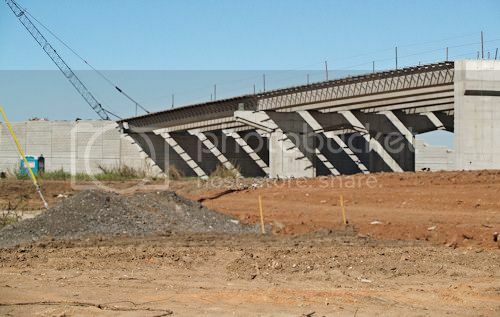 Between Penn & Western, only roadbeds and bridgework have been done. This view looks east to the Pennsylvania bridge. Another bridge, not sure which one ... Western? Looks too small for Western ... maybe Blackwelder? I thought I might be the 1st to make this drive. Nope. Darn Southsiders beat me to it! The last trick was to figure out how to get out of the place. It wasn't easy. Ahh ... the Pennsylvania sign! 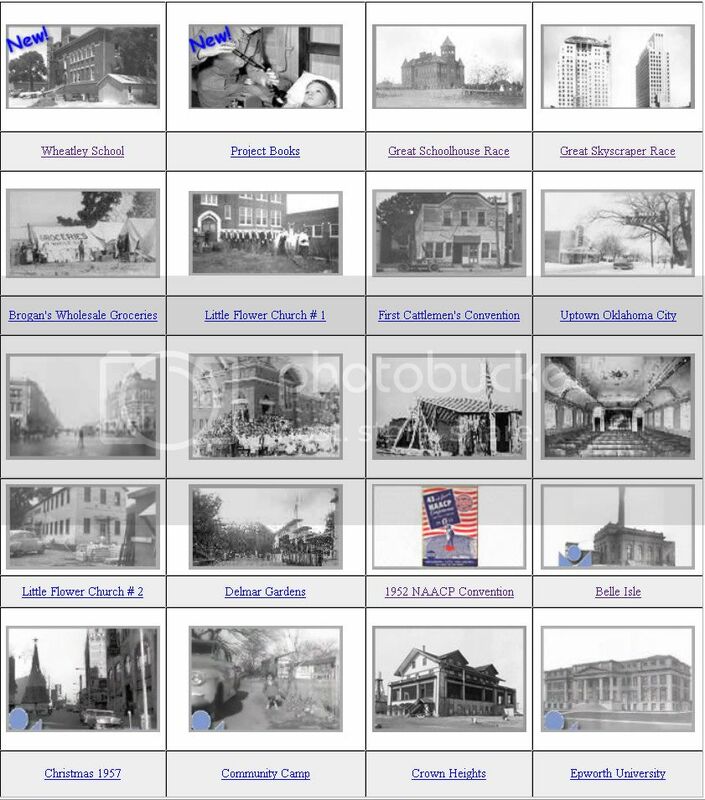 What's the best source for researching Oklahoma City History? That's easy — it's the Oklahoma City Metropolitan Library System, MLS for short. And much of it is available in your own home, or in your hotel room while you're traveling — anywhere you have a a computer and internet availability. Some parts are available to anyone. For some of the best research tools, though, all you need to know is your MLS library card and your own last name. 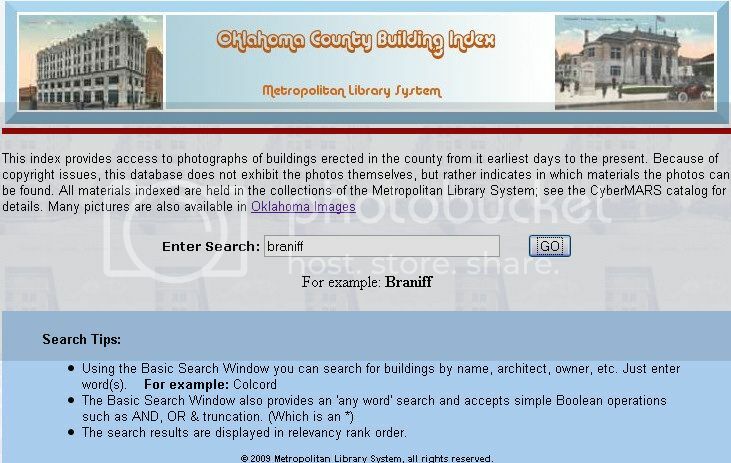 This brief article gets you started in seeing how to use some of the great resources of the Oklahoma City Metropolitan Library System. To get you started, I've put together a little flash slide show. Although it runs by itself, with between 5 and 10 seconds between each slide, it contains controls to pause, move forward or backward, as you chose. Due to width and height limitations in this blogger format, three of the pages are hard to read, but a "Larger" button is available on those pages click on the button and the slide show will pause and the page will open in a separate window or tab for a larger view. 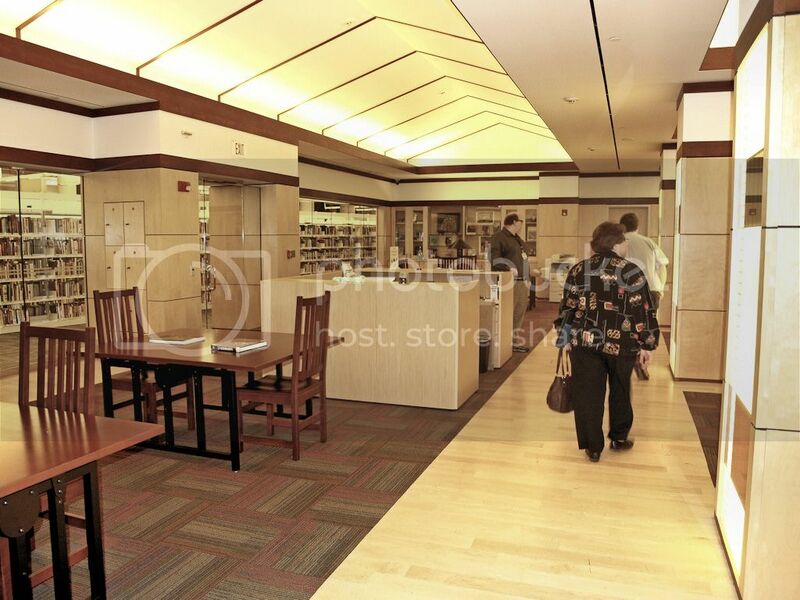 This article does not develop the history of the downtown library — click here for that. It does not particularly show how to use the Oklahoman's archives — click here for that. It does not show you how to use the Sanborn Maps feature — click here for that. 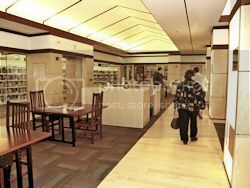 The focus of this article is to point you to areas in the Metropolitan Library System that will be helpful in your Oklahoma City history research — Internet Links, below, and The Oklahoma Room at the end of this article. MLS Home Page. From here, most if not all of the other items listed below can be located, even though the more direct links will get you there more quickly. However, for the numerous MLS areas and items (e.g., calendar of events, downloadable audio books area) which are not listed below, start at the MLS home page. Library Member Logon Page. If you are a card carrying member of the Metropolitan Library System, this is your first stop before accessing the external commercial databases which MLS gives you free access to, e.g., the Oklahoman archives and the Sanborn Maps. MLS library cards are free for qualifying persons. Generally, that includes those who live in or own property in Oklahoma City or Oklahoma County and, via a reciprocal service agreement with the Pioneer Library System headquartered in Norman, those who live, work, or attend school in Cleveland, McClain or Pottawatomie counties and for Blanchard school district students living in Grady County. Go here for more particulars. The two commercial databases that I use regularly are the Oklahoman archives and Sanborn Maps, below. 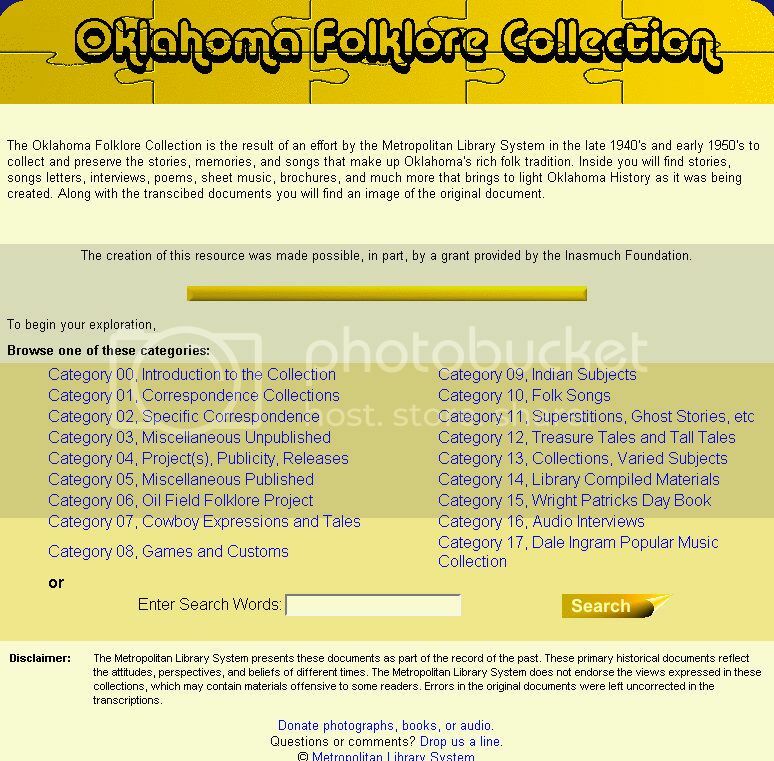 Oklahoman archives. There is no direct link for this. After logon, click the Databases menu item and then click the Newspaper tab. 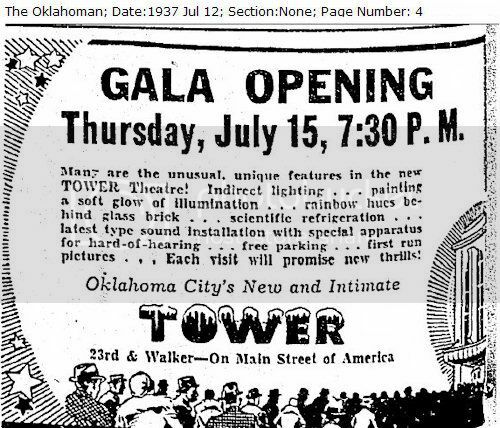 On the page that opens, click on Oklahoman Electronic Archives. For detailed instructions, click here. Sanborn Maps. There is no direct link for this. After logon, click the Databases menu item and then click the Oklahoma tab. On the page that opens, click on Sanborn Maps. For detailed instructions, click here. 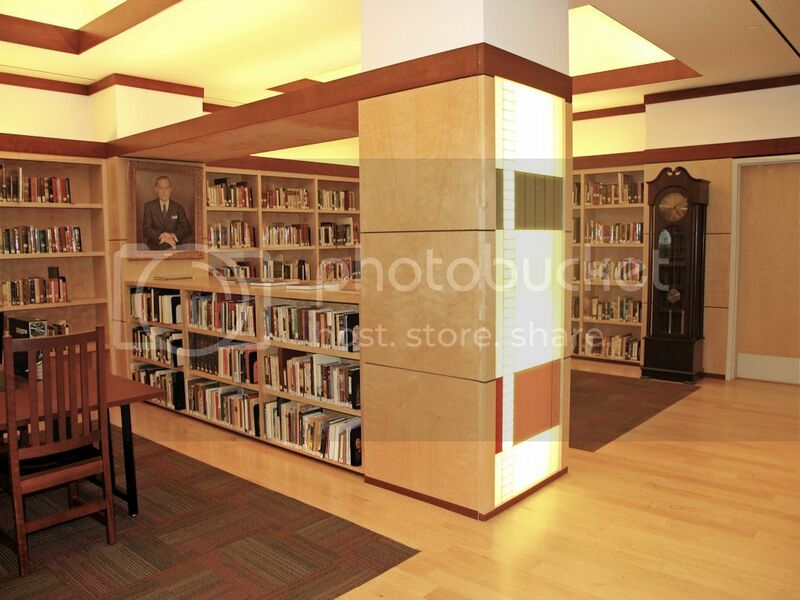 Buddy Johnson also advises that, in addition to these on-line versions, the downtown library also has original microfilm which is much more legible, very large size and can be printed on 11 x 17 inch paper. A very high resolution image can also be obtained from the Sanborn map PDF files but only if you have a full version of Acrobat (or a similar program, but not Reader) since in such a program you have the option of extracting images in PDF files and saving them to a TIF (best) or other graphic format. The images so extracted from a Sanborn map file are typically 5100 x 6088 pixels at 600 dpi, which ain't too shabby. After extraction, it becomes possible to crop an image to suit your needs. Oklahoma Images. 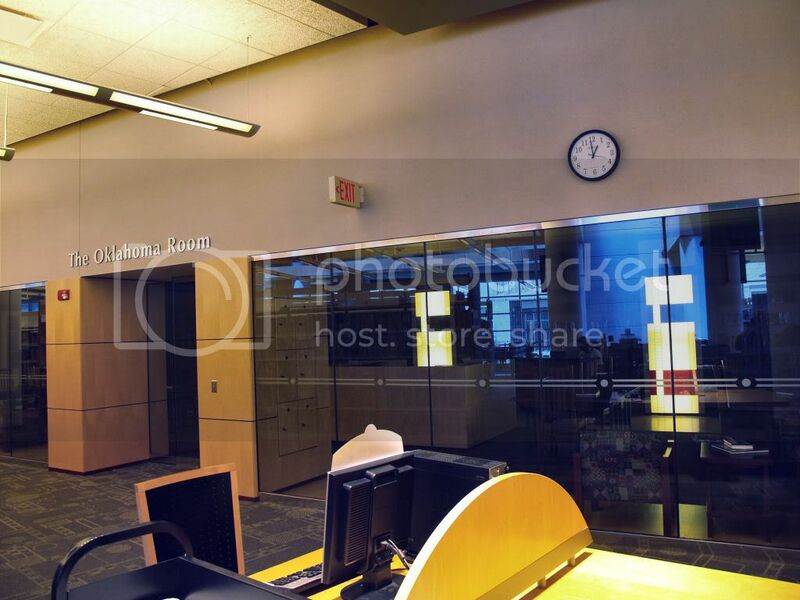 Although this area can also be accessed via the databases after member logon, it's not necessary to do that since this area is not restricted to library members. Here, images of the city's past, as well as essays on many different topics, can be searched for, seen and read. 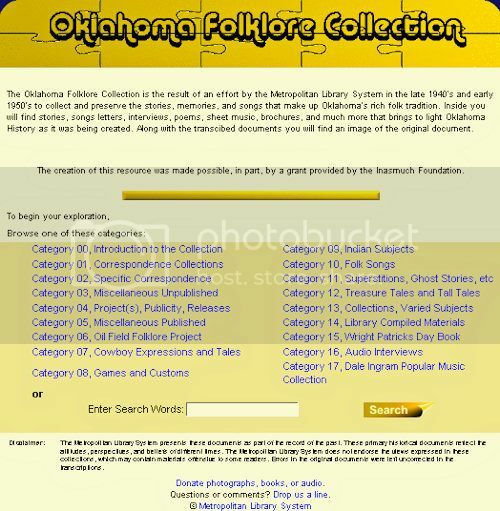 The fine print at the top reads, "The Oklahoma Folklore Collection is the result of an effort by the Metropolitan Library System in the late 1940's and early 1950's to collect and preserve the stories, memories, and songs that make up Oklahoma's rich folk tradition. 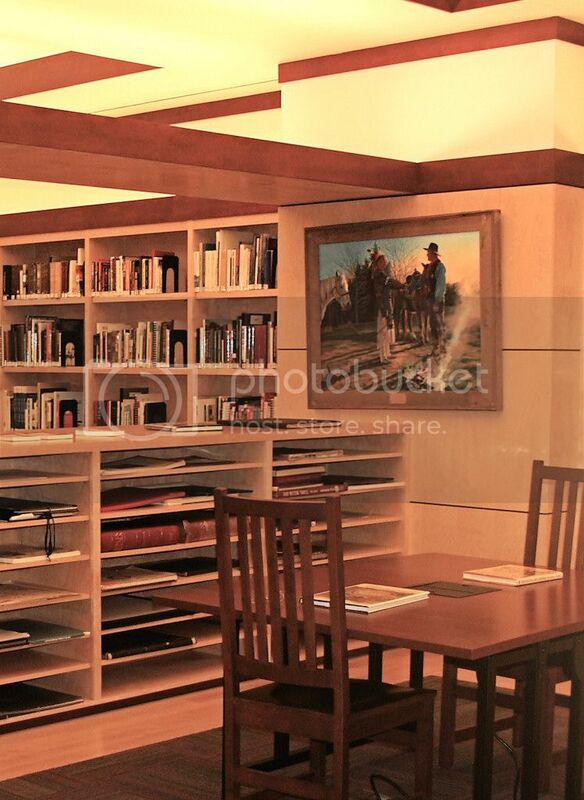 Inside you will find stories, songs letters, interviews, poems, sheet music, brochures, and much more that brings to light Oklahoma History as it was being created. Along with the transcribed documents you will find an image of the original document." info Magazine. This is MLS's monthly magazine. It always contains an interesting Oklahoma City history article (usually if not always written by Larry (Buddy) Johnson) — the above slide show presents 3 of them. As well, the magazine contains other interesting articles and the MLS monthly calendar of events which is quite extensive. The files are PDF files which require a recent version of the Adobe Acrobat Reader (my old 5.0.1 version of the full Acrobat program cannot read them but after installing the latest version of the Reader, all went well). Unfortunately, I've not yet been able to view any of these videos. My understanding is that they are WMV files and that a late version of Microsoft's Windows Media Player is required. But, I have the latest version of that program on two of my computers and neither computer can read the files. Hopefully, that problem will be addressed by MLS's technical team in the near future. 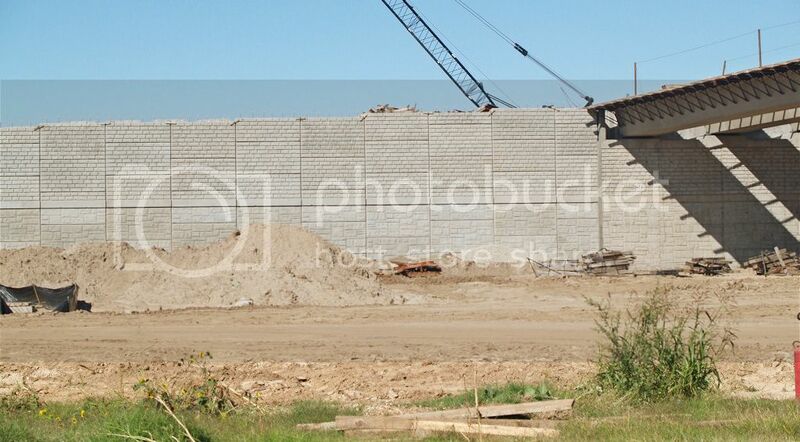 Oklahoma County Building Index. This nifty MLS feature is hard to find but it's in the in-house database area. Click the graphic below for a larger view. The text at the top of that page reads, "This index provides access to photographs of buildings erected in the county from it earliest days to the present. Because of copyright issues, this database does not exhibit the photos themselves, but rather indicates in which materials the photos can be found. All materials indexed are held in the collections of the Metropolitan Library System; see the CyberMARS catalog for details. 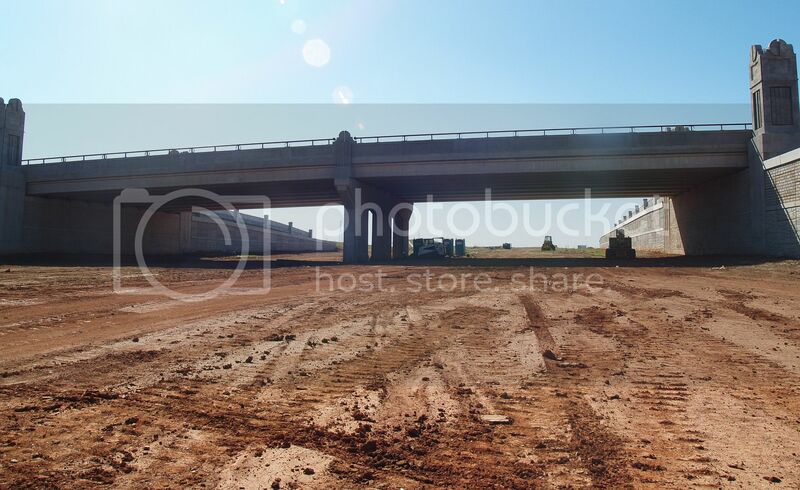 Many pictures are also available in Oklahoma Images." Doing a search for "Braniff" shows what is returned — click the image below for a better view. 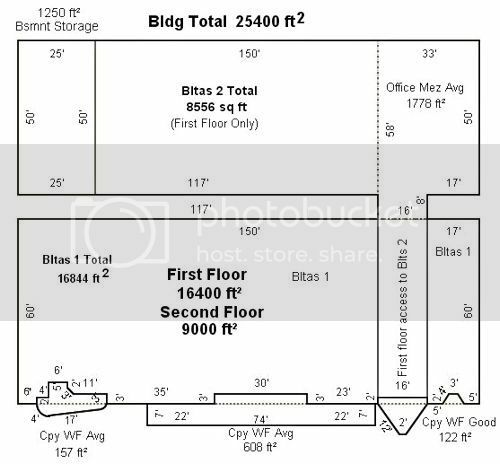 My only criticism of the Oklahoma County Building Index database/feature is that there does not appear to be an "index" of the Index so that a list of included buildings is presented at a glance. That would be handy to have, particularly since the page's name includes the word, "Index." One has to know/remember the name of a building to search for it and a single list would be particularly helpful for those having not-the-best memory brain cells like me! That said, it's a handy resource and well worth having. A work-around to the absence of a list is to type, "OK," as the item to search for and 300 Abstracts are returned, which I take to be number of items in the database. You can also search by street (spell out the numbered streets) or by address. THE OKLAHOMA ROOM. The above gives internet links for MLS internet-available research. Alas, not everything is available on-line (yet). 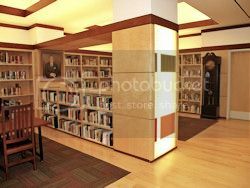 That's where the Oklahoma Room on the 2nd floor of the downtown Ronald J. Norick Library & Learning Center comes in handy. The Oklahoma Room contains the MLS collection of quality books and other documents (e.g., old plats, maps, etc.) which specifically focus on Oklahoma (and Oklahoma City). 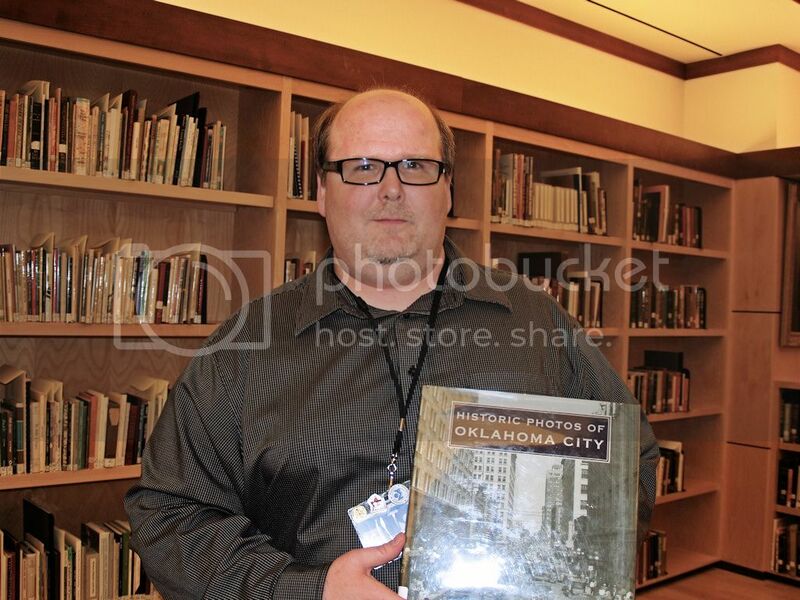 Often those books are rare and out-of-print and they are often fundamentally important when a researcher is looking for detail about numerous Oklahoma City history topics. 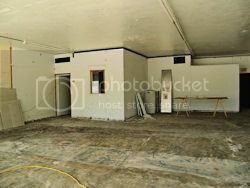 Below are a few pics taken September 22, 2009, inside the Oklahoma Room. My host was Larry (Buddy) Johnson who maintains the room and under whose guidance, often pen, research of Oklahoma City history by the MLS is done. 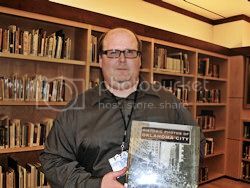 Above, you will have noticed that he writes brief Oklahoma City history articles in each info magazine and that his lengthier essays are found in MLS's Oklahoma Images database. Larry "Buddy" Johnson has been with MLS since 1998. Not only a librarian at the Downtown Library, he is the brilliant mind behind the Oklahoma Images database which is a collection of pictures and essays that illustrate the history of central Oklahoma. 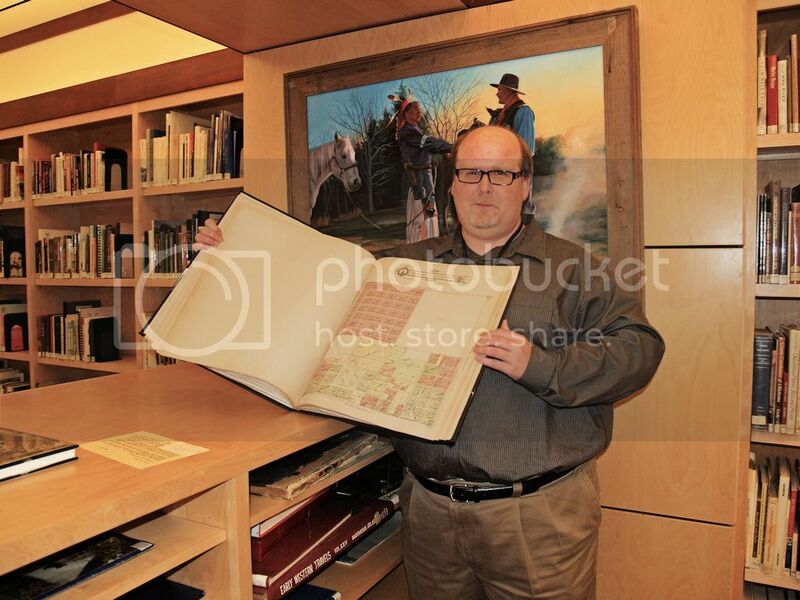 at right, Buddy displays a plat book of early Oklahoma City. 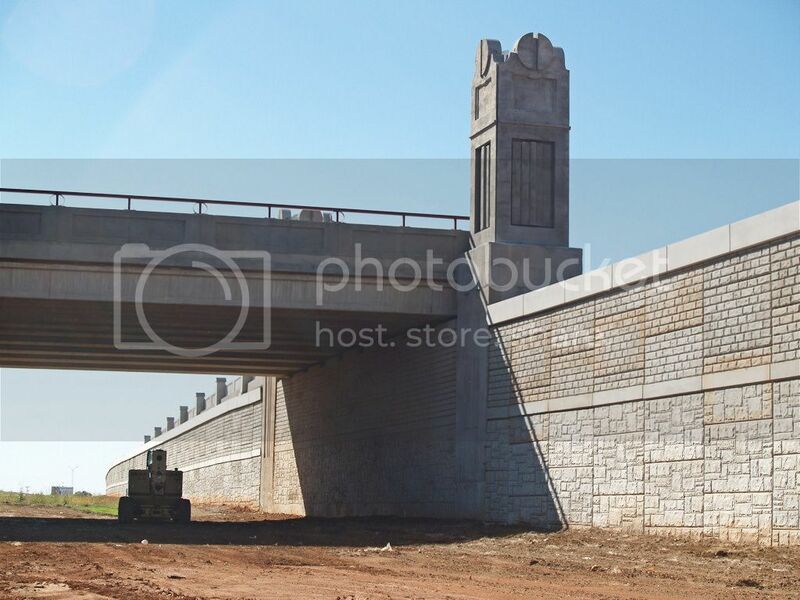 Buddy is the author of Historic Photos of Oklahoma City (Turner Publishing Company 2007). At left, below, he proudly holds his baby. The occasion for my presence was a meeting of an as yet secret society in the process of formation — I am forbidden to tell you that it has to do with — oops! Almost did! At right below are two additional friends and co-conspirators, one new and one old. 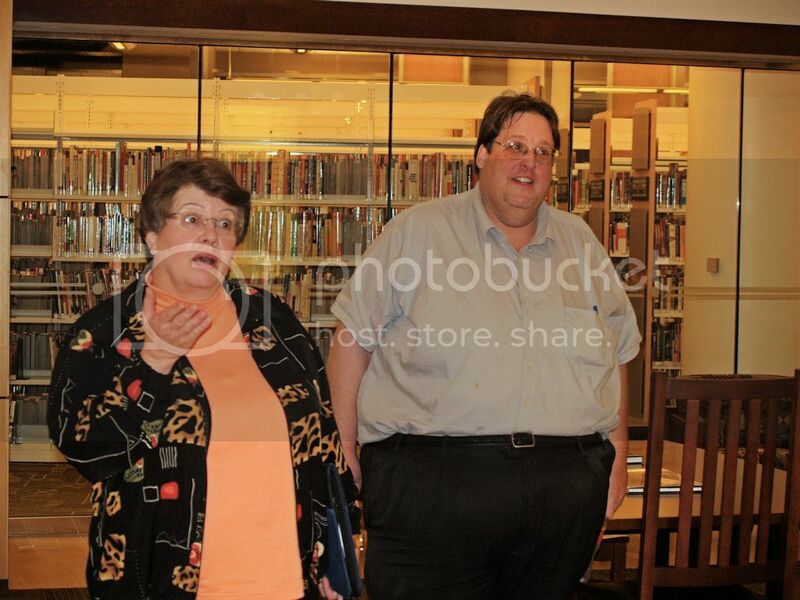 The lady is the new friend, Carolyn D. Cuskey, Coordinator & History Professor, Rose State College and its Atkinson Heritage Center; the guy at the right is old friend Steve Lackmeyer, co-author with Jack Money of OKC: 2nd Time Around (Full Circle Press 2007), author of Bricktown (Arcadia Publishing 2009), and co-author with Jack Money of the soon to be published The Skirvin (Full Circle Books 2009). 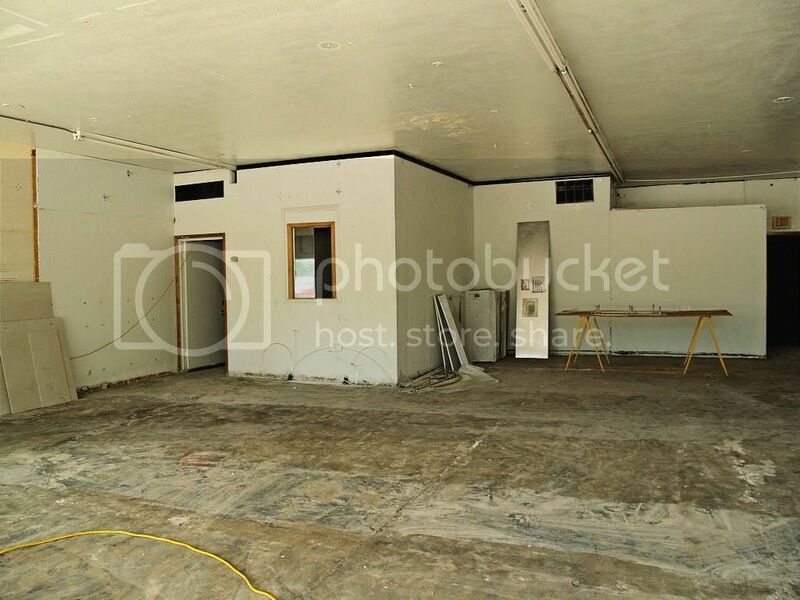 After these photos were taken, a meeting was held in a secret room by the secret group. 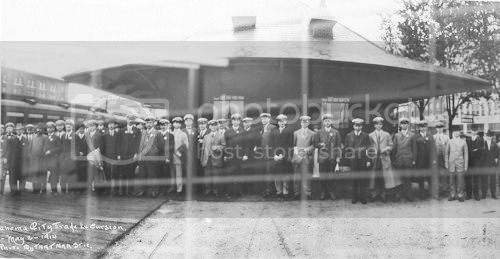 During that, I noticed a cool photo on the wall — sorry that it's got camera glare in it but it's still worthwhile publishing — a rare photo of the old downtown Frisco depot in 1914. The second is a crop of the first. Click on either for a larger view. Started on September 2, 2009; completed September 14, 2009. 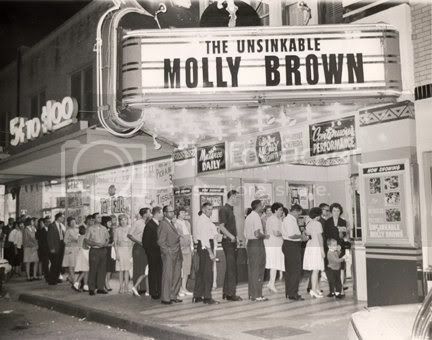 Why many vintage movie houses called themselves, "theatRES," instead of ordinary American English, "theatERS," I don't know, but the reason must have had something to do with them saying, "We are SPECIAL," and, for many of those theaters, including this one, that's exactly what they were. 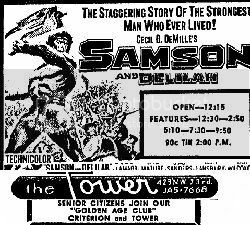 Of Oklahoma City's early suburban movie houses, the Tower wasn't among the first. The 1928 Ritz (1020 E. 13th - NE 13th & Stonewall), the 1928 Victoria (northwest corner of Classen & NW 18th), the 1928 Circle (2510 S. Robinson), and the 1919 Aldridge in Deep Deuce at 303-305 N.E. 2nd all predated the 1937 Tower Theatre at 425 N.W. 23rd, as did the 1935 Plaza at N.W. 16th and Indiana. 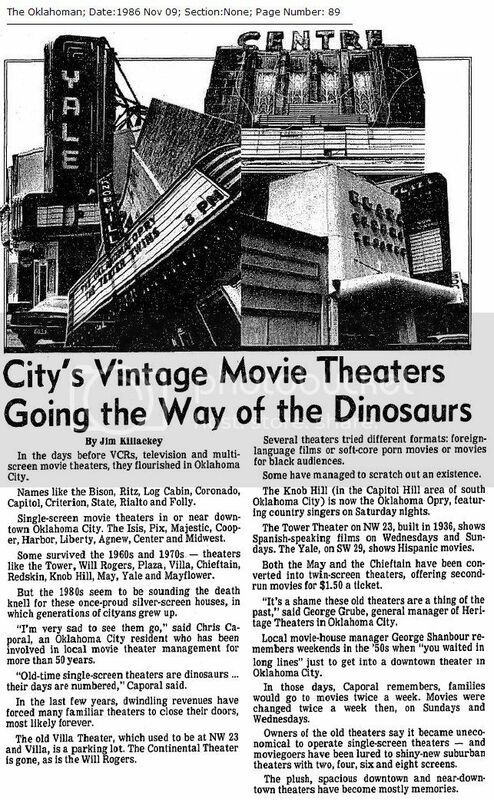 While not at all close to being the earliest Oklahoma City suburban movie theater, it was arguably the finest of those built before the closing of downtown's many fine movie houses in the 1970s. The Ritz, the Circle, and the Aldridge are gone; only a vestige of the Victoria remains but in a fairly non-recognizable form. The renovated Plaza has lately fared better becoming the home of Lyric Theater today. 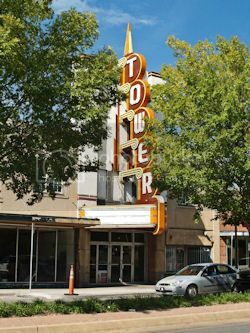 The Tower, despite its tough times beginning in the early 1970s and continuing through the present day, has somehow kept on hanging on, and, indeed, the Tower shows real signs that it may come to breathe new life again. This article tells the story of the old Tower Theatre and discusses what it may yet become. Down But Not Out Will Rebirth Happen? 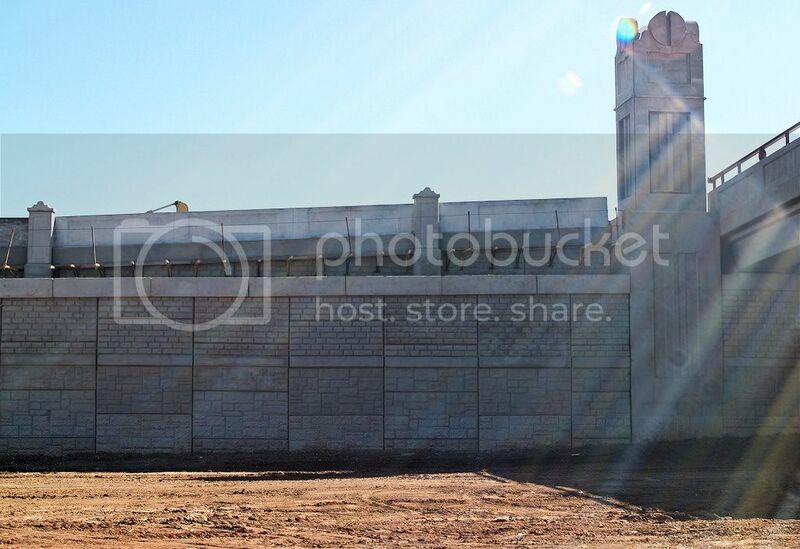 Plans are being rushed for the early start of the new Tower theater to be erected on Twenty-third street, just east of Walker avenue and it is hoped to have the auditorium ready for occupancy shortly after the Christmas holidays. 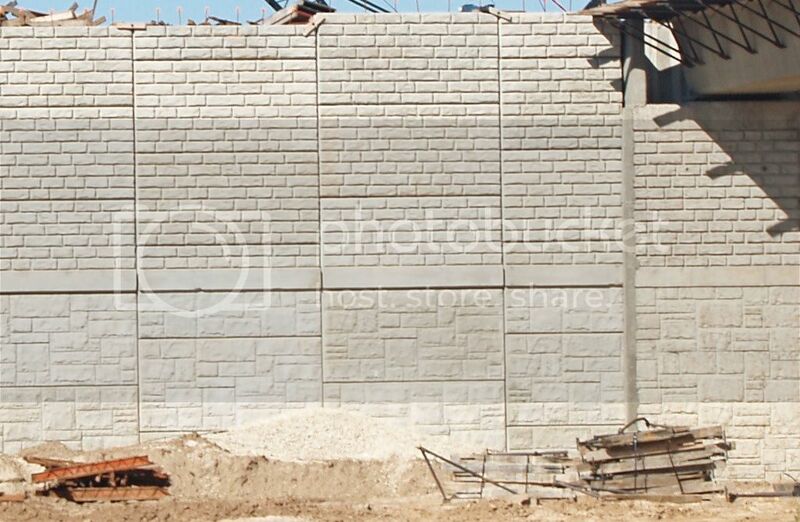 The final draft of the architect's plans for this new and modern edifice calls for the latest in theater construction and convenience to patrons. It will be one of the largest of the neighborhood houses in this part of the country with both a lower floor and a balcony. Charles E. Watson, Oklahoma City decorator, who went to California to survey the newer Hollywood houses has chosen futuristic design for the auditorium. The Tower was designed by W. Scott Dunne, Dallas architect. 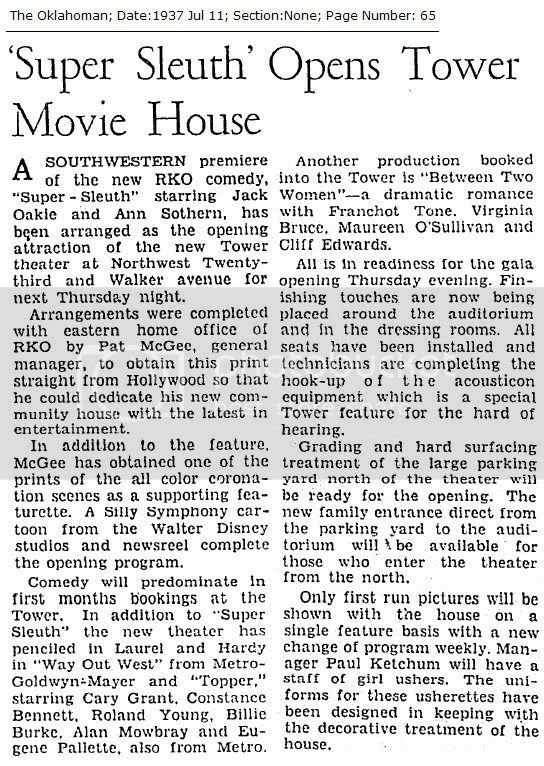 A July 11, 1937, Oklahoman article reported that "Super Sleuth" starring Jack Oakie and Ann Sothern would be the theater's 1st of many 1st-run presentations, others already booked being MGM's "Way Out West" (Laurel & Hardy), MGM's "Topper" (Cary Grant), and "Between Two Women," a drama staring Fanchot Tone and Maureen O'Sullivan. On July 15, 1937, Opening Day finally arrived. 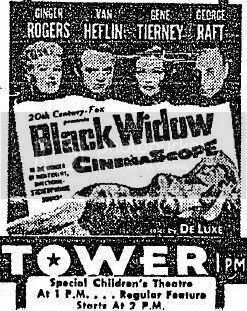 The Tower was initially owned by the same group that owned the Criterion, Midwest, Liberty, Ritz, Victoria, Warner and Plaza theaters, the Standard Theaters Corporation, and the group's newspaper ads were typically joined together as shown in the April 17, 1938, example at the right. He took the money from Robert Busch, 30-year old manager of the theater, after four theater employees, the assistant manager and four patrons were forced to lie on the floor of the office. Unhurriedly, he thoroughly searched the large steel safe, took the money sacks and money box and calmly walked out of the back door of the theater. 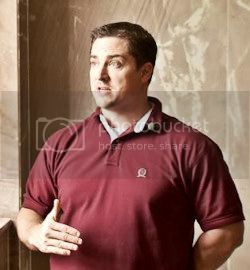 [An employee said ] "He met me on the landing upstairs by the dressing room," said Virginia Bowles. * * * When I started into the dressing room he stuck a gun in my said and said, 'This is a stick up. Come along and be quiet.'" Witnesses described him as about 30 years old, 5 feet 9 inches tall, slender, blond, wearing a green felt had and black overcoat. 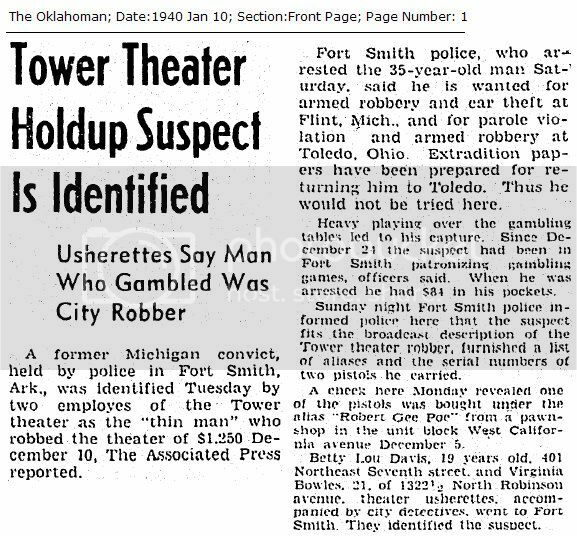 A few months later, in January 1940, the robber was apprehended in Ft. Smith, Arkansas, and was identified as being the "thin man" who had committed the offense. 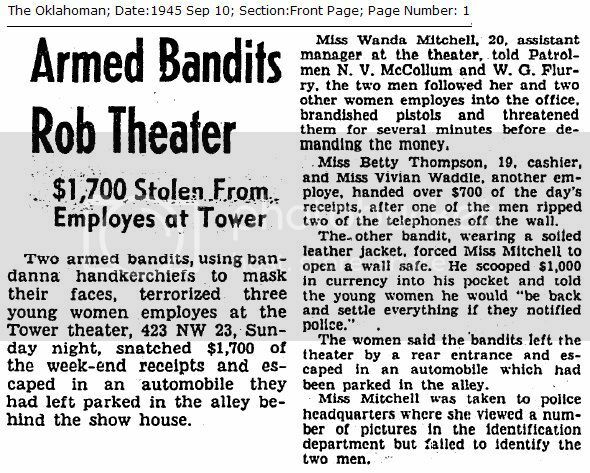 As to the second robbery, in September 1945, it didn't match the interest or irony of the above. Three or four local teenagers stole $1,700 from Tower employees, and you can read about that here, if you want. 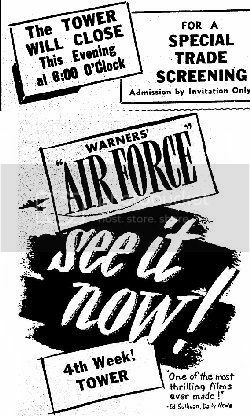 Below are a few ads sampling movies shown at the Tower from 1938 through 1956. The Tower continued to do well for a few years after the mid-1950s but into the early 1960s all was not so good. 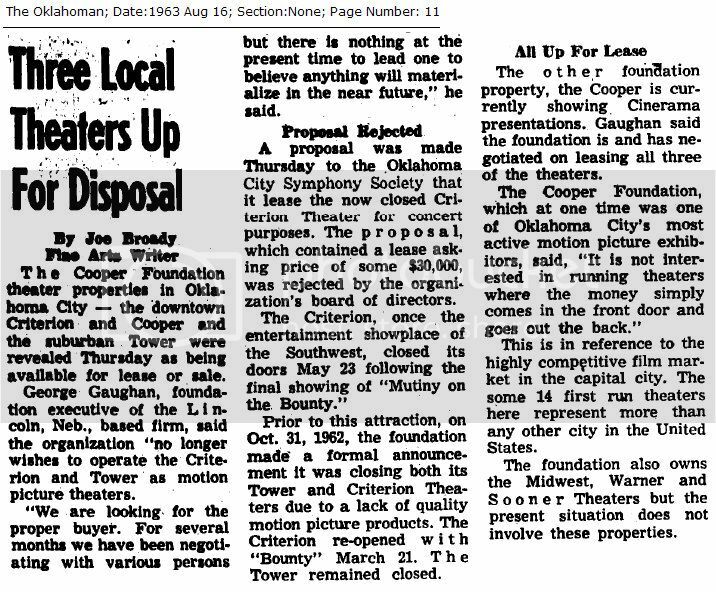 My research does not disclose a clear reason for the decline, but one possible explanation is that downtown theaters were not doing as well they once did and the Cooper Foundation was heavily invested in downtown's Criterion, Midwest and Cooper. 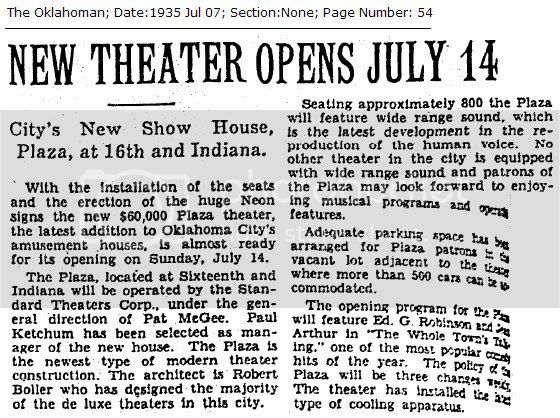 Just as retail had flocked from downtown to suburban shopping, new and desirable theaters with free and easy parking was doing the same. New suburban movie houses like the Westwood and the Continental are examples. The Cooper Foundation may just have disliked the local competitive process to get new bookings, as will be discussed below under "Shanbour: The 2nd Golden Era." 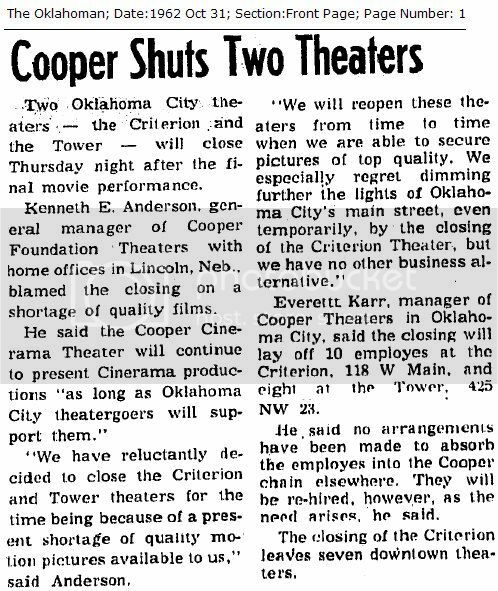 George Gaughan, foundation executive of the Lincoln, Neb., based firm, said the organization "no longer wishes to operate the Criterion and Tower as motion picture theaters. We are looking for the proper buyer. For several months we have been negotiating with various persons but there is nothing at the present time to lead one to believe anything will materialize in the near future," he said. The Criterion, once the entertainment showplace of the Southwest, closed its doors May 23 following the final showing of "Mutiny on the Bounty." 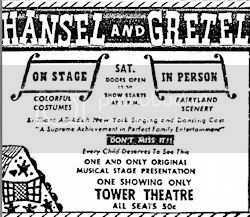 Prior to this attraction, on Oct. 31, 1962, the foundation made a formal announcement it was closing both its Tower and Criterion Theaters due to a lack of quality motion picture products. The Criterion re-opened with "Bounty" March 21. The Tower remained closed. The above sampling doesn't show a shabby a collection of movies, in my opinion. FARRIS SHANBOUR: THE 2ND GOLDEN ERA. There are really two different "Golden Eras" for the Tower — the 1st was from its birth in 1937 through the late 1950s; the 2nd commenced when the Tower was acquired in September 1963 by Farris Shanbour, a 1942 Criterion doorman and upstairs usher, and his partner Charles A. Shadid, as reported in a September 11, 1963, Oklahoman article. 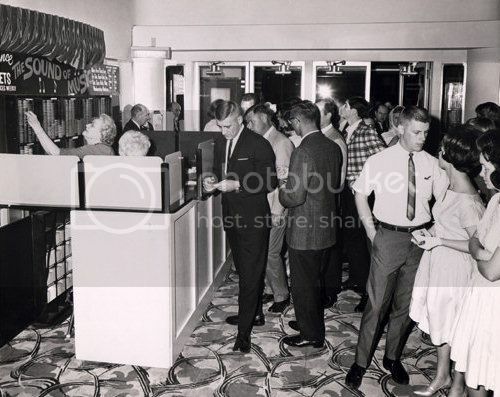 The reopening of the downtown Criterion is the story from which movies are made: He started in the theater in 1942 as a doorman and upstairs usher. 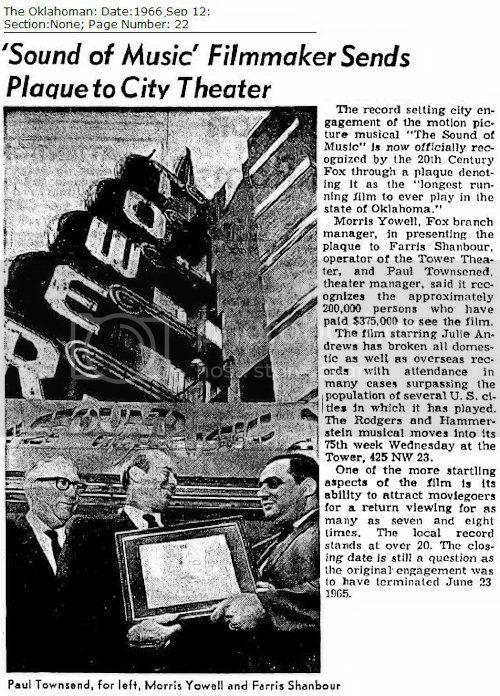 Although the 1967 article focuses on the reopening of the Criterion, it also reflects upon his involvement in the Oklahoma City movie business, including being the Tower's manager in 1946. 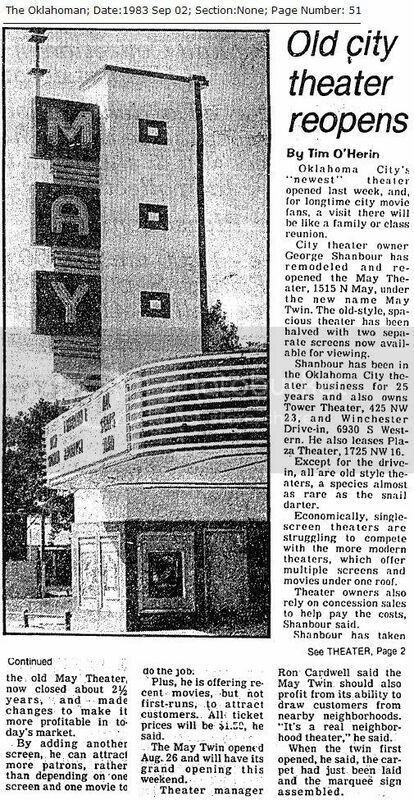 When Shanbour and Shadid purchased the Tower, they already owned and operated the Plaza and Hillcrest Drive In theaters. 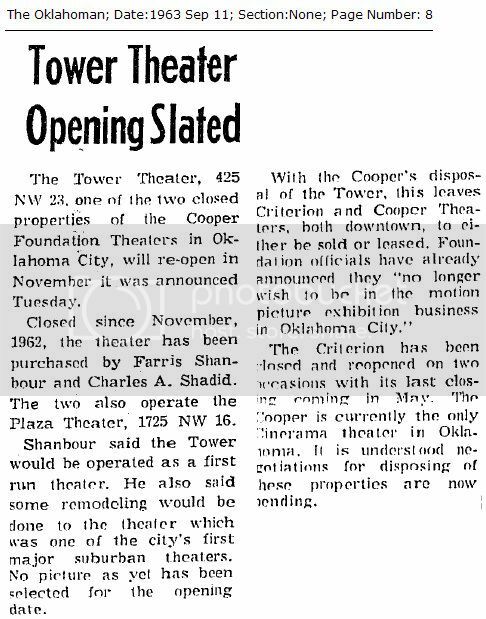 In the September 9, 1963, article, Shanbour was reported to say that the Tower would be operated as a first run theater, that some remodeling would be done, and that the theater would reopen in November. It did. 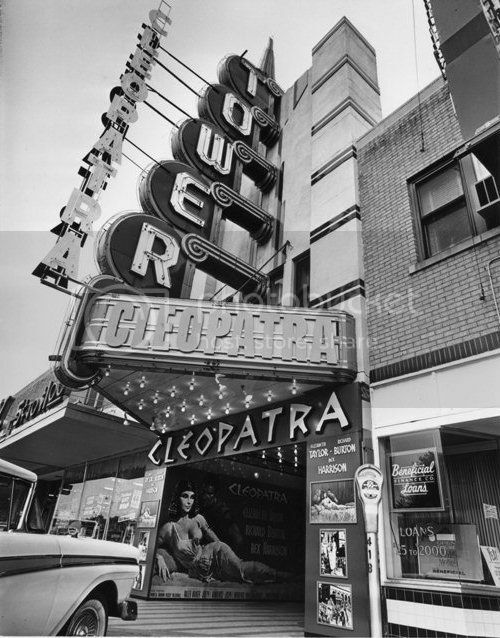 After a $10,000 remodeling plus installation of $30,000 of new Todd-AO equipment, the Tower's new owners made their announcement that the Tower would reopen with a bang on November 13, 1963, with the 1st city showing of "Cleopatra" starting Elizabeth Taylor, Richard Burton, and Rex Harrison. 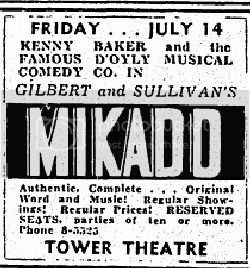 The extravagantly produced, often critically panned, production certainly made the point that the Tower Theatre was back in business, big time. And it was. 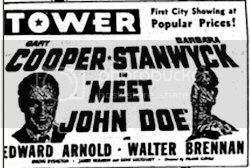 Under the Shanbour/Shadid ownership and management which lasted until early March 1970, the Tower Theatre was, indeed, a place entitled to the "I'm special" spelling of its name. Oklahoma City is slightly unique in that of its 46 theaters, 14 of these show first run attractions. These 14 are operated by eight different companies instead of single ownership of the majority of first run houses in other major cities. All first run films are played on a bid basis — the distributor simply takes the highest bid — and the local competition is sometimes financially severe. First run houses outnumber practically every major city in the U.S. Theater ownerships include the Center and State, State Theaters, Inc.; Midwest, Greater Oklahoma City Amusements Inc.; Villa, Farris [ed note: should be Ferris] Enterprises; Shepherd Twin, Snyder-Ashley Enterprises, and the Will Rogers and May, Video Theaters Inc.
Farris Shanbour didn't always get first run movies but of the 58 or so productions at the Tower those that were not first run were almost always excellent movies. I've compiled a chronological list of what I call "The Tower's Movie Legacy Under Shanbour & Shadid" and you can see it here. As good as such lines were, the Tower is probably remembered by most for its hosting of "The Sound of Music." 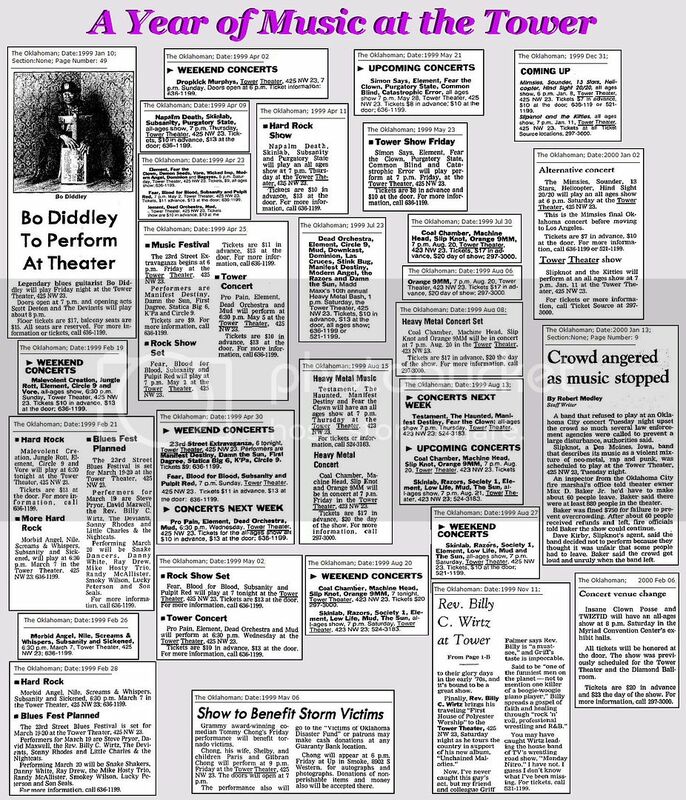 Click the ad for a larger view. 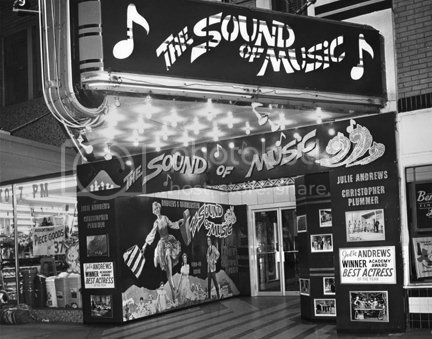 "The Sound of Music" opened at the Tower on April 7, 1965, for a run intended to close on June 23, 10 weeks later. 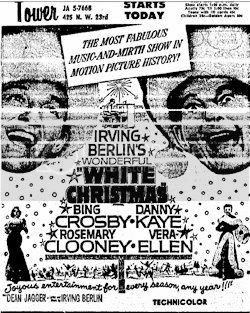 Instead, the last showing was on November 1, 1966, a run of 82 consecutive weeks. The September 12, 1996, Oklahoman article shown below shows Farris Shanbour at the right receiving a plaque from a 20th Century Fox representative for the longest running movie in Oklahoma's history. 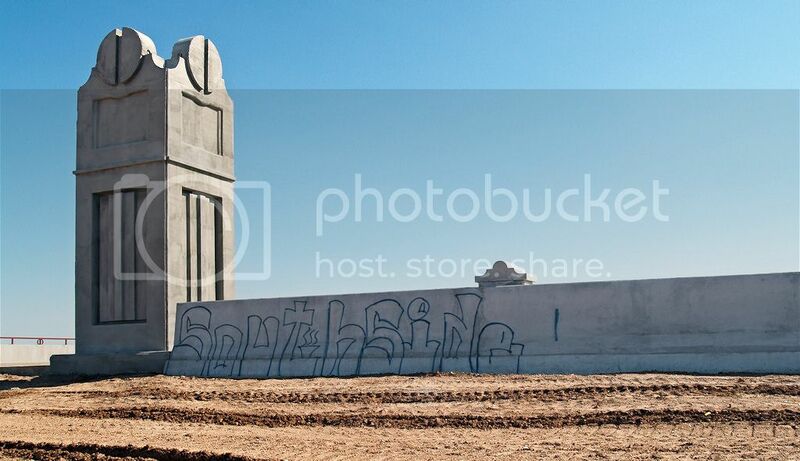 Following that are three additional photos from okctower.com. Inside During "Sound of Music"
Shanbour and his financial partner weren't content to leave well enough alone. 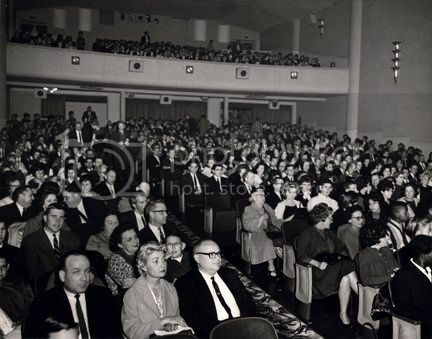 In June 1966 they remodeled an old church and turned it into the Park Terrace Theater at 5801 S. Western thereby giving the Capitol Hill vicinity its first new theater in decades. At the Tower, the September 25, 1966, Oklahoman article mentioned earlier said that $300,000 was then being spent on remodeling but the next article mentioned places the number at $50,000 and another articles uses the smaller number, also. 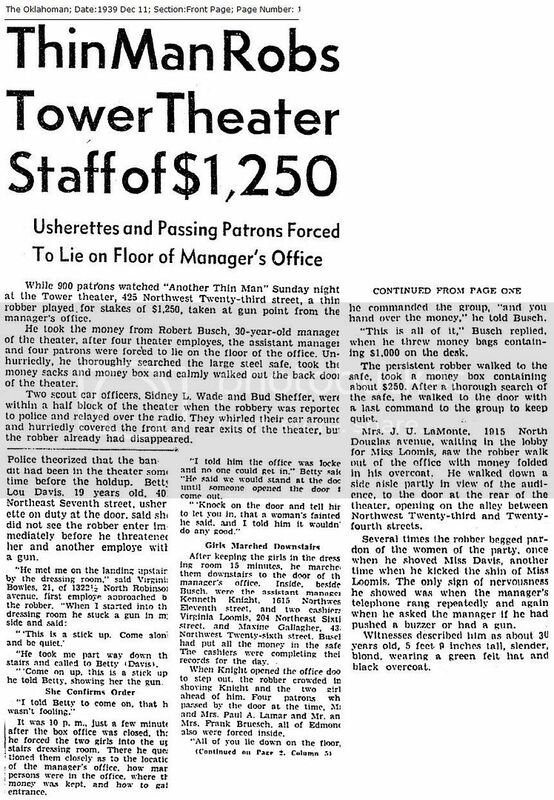 Whichever, after the "Sound of Music" closed its run on November 1, 1966, on January 16, 1967, a 3-alarm fire essentially gutted the Tower's interior and caused damages of $200,000. 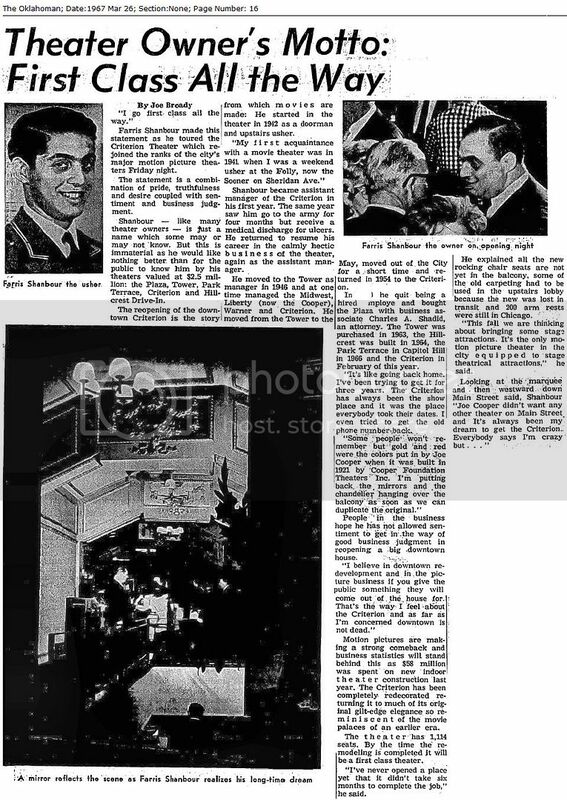 This January 17, 1967, Oklahoman article gives the report. 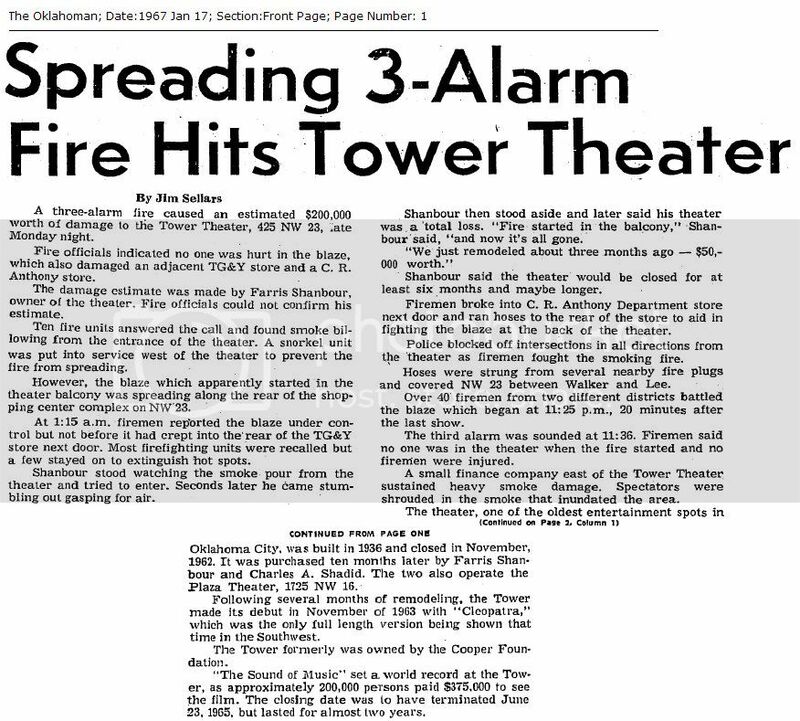 At about 11:25 p.m., about 20 minutes after the last show of "The Blue Max," a fire broke out in the balcony. None were injured. After the fire, Shanbour projected that the theater would remain closed for at least six months. 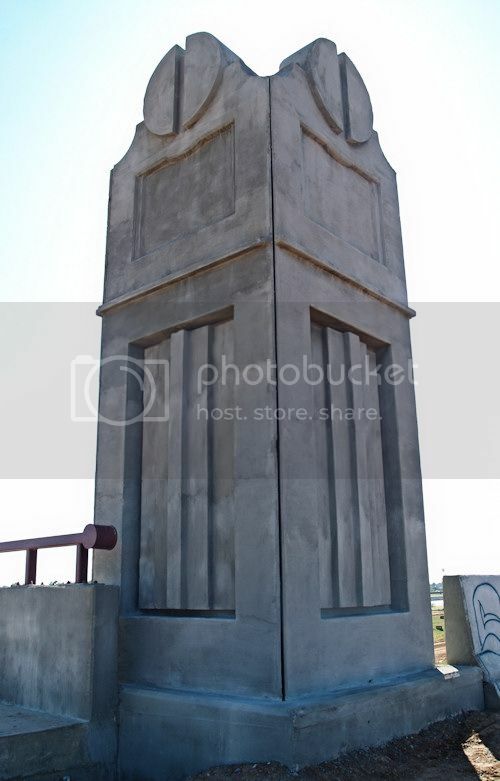 Possibly, he was downhearted and depressed when making that projection because Shanbour obviously got his competitive juices flowing quickly since a February 21, 1967, article reported that the Tower would reopen in March. 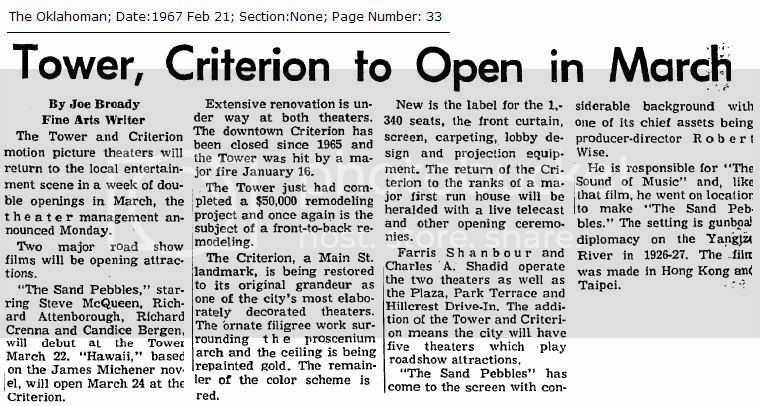 By this time, Shanbour and Shadid had also acquired the Criterion and were determined to restore the downtown classic icon to its former glory (which they did). 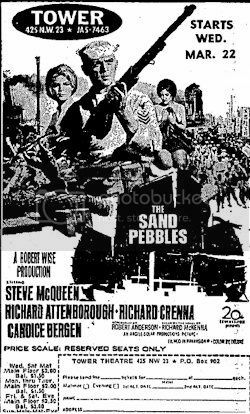 But, as to the Tower, it opened on March 22 with the showing of yet another blockbuster, "The Sand Pebbles" starring Steve McQueen and the movie had a run of 19 weeks, ending on August 1. 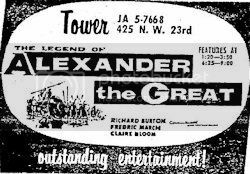 Throughout the remainder of Shanbour's operation of the Tower, it continued to run many first run films with a mix of some good oldies. 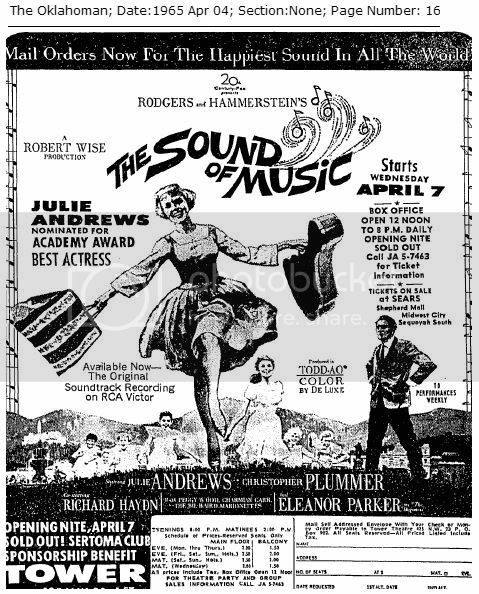 Other 1st runs in 1967 were "The Flim Flam Man" (George C. Scott, Sue Lyon) and the opening of "Camelot" staring Richard Harris and Vanessa Redgrave. In 1968, "Camelot" finished its run of almost 25 weeks, followed by other first run films: "Half A Sixpence" (Tommy Steele); "Private Navy of Sgt. O'Farrell" (Gina Lollobrigida, Bob Hope, Phyllis Diller); "The Fox" (Sandy Dennis, Keir Dullea, Anne Heywood), "Prudence and the Pill" (Deborah Kerr, David Niven); "Therese & Isabelle" (Essy Persson); "The Split" (Jim Brown, Gene Hackman, Ernest Borgnine); "Coogan's Bluff" (Clint Eastwood); and "Star" (Julie Andrews, Richard Crenna). In 1969, "Star" completed its run followed by "Faces" (John Marley, Gena Rowlands); "Night of the Following Day" (Marlon Brando, Richard Boone); "Midas Run" (Richard Crenna, Anne Heywood, Fred Astaire); "Loves of Isadora" (Vanessa Redgrave); "The April Fools" (Jack Lemmon, Catherine Deneuve); "Staircase" (Rex Harrison, Richard Burton); "Libertine" (Catherine Spaak); "Me, Natalie" (Patty Duke); "A Nice Girl Like Me" (Barbara Ferris, Harry Andrews); and ending the year with "Hello Dolly" (Barbara Streisand, Walter Matthau) which opened on December 17, 1969. With "Hello Dolly," the Shanbour/Tower era would end with a bang. 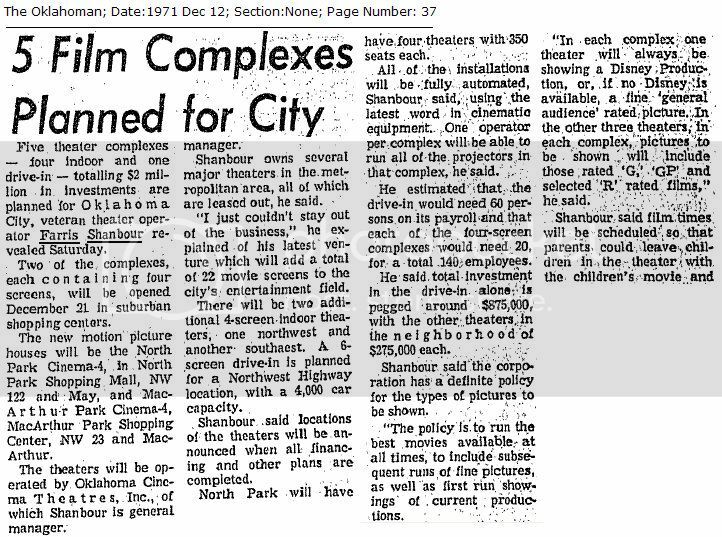 A March 5, 1970, Oklahoman article reported that Shanbour & Shadids' holdings had been leased "for an extended time" to Spetro Threatres, owned by Ferris Enterprises which, by that time, already included the Centre, Villa, State, Edmond Plaza, Hollywood in Norman, Apollo Twin and Cinema 70 Drive In. 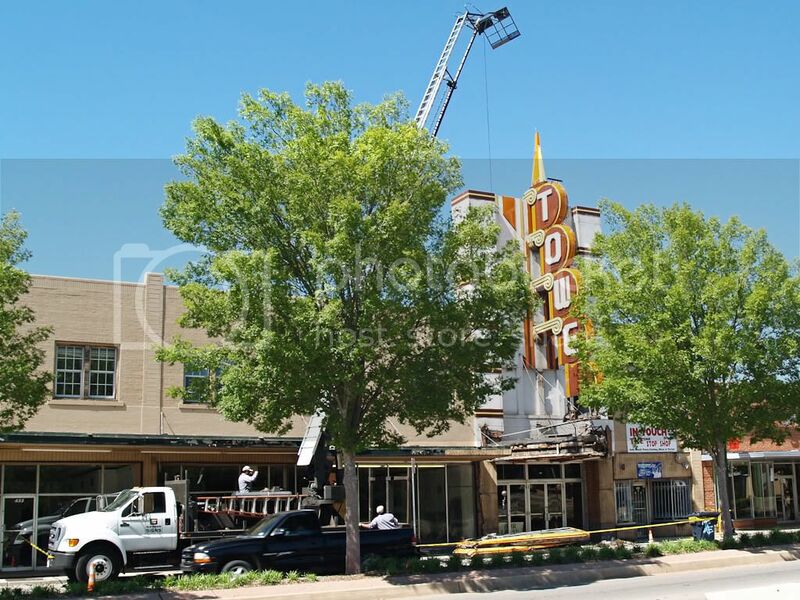 Also by this time, Shanbour and Shadid had built the Quail Twin so it and the Plaza, park Terrace, Winchester Drive In, Hillcrest Drive In, and the Tower were included in the transaction, bringing under Spectro's banner 17 of the 53 screens in the Oklahoma City area. 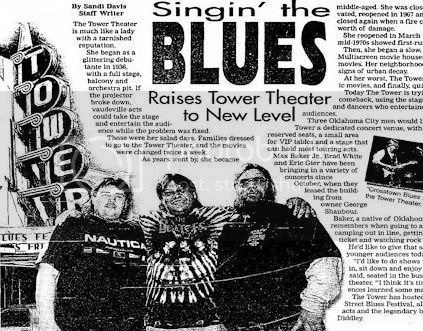 While the Tower under Spectro's flag would continue to do well for a time, the transfer marked the end of the Shanbour era as far as the Tower and other theaters were concerned. 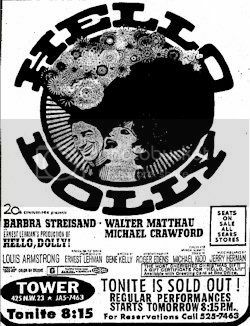 "Hello Dolly" closed on May 20, 1970, following a run of 22 weeks. THE DOWNWARD SLOPE. In November 1967, the Spectro theater group included the Villa, Cinema 70 Drive In, and the Edmond Plaza. 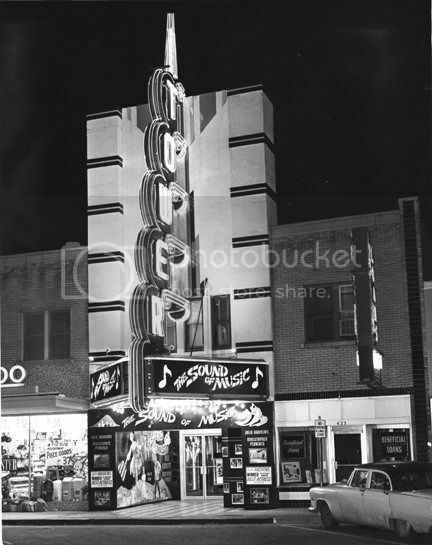 But, in June 1970, shortly after adding the Tower to its group of owned or leased (the Tower was leased) group, theaters with the "S" shield had grown to at least 15 and included: Apollo I, Apollo II, Centre, Cinema 70, Criterion, Edmond Plaza, Hillcrest, Park Terrace, Quail Twin, Quail Twin, State, Villa, Westwood, Winchester, as well as the Tower, and for several years the Spectro group was clearly the behemoth of Oklahoma City movie operations. 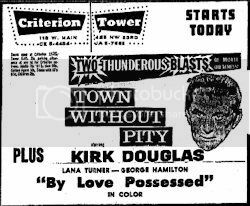 During the remainder of 1970 and for a time thereafter, the Tower continued Shanbour's tradition of showing quality films, even if fewer first-run blockbusters are apparent from the list. In 1970, the list included "The Walking Stick," "The Games," "2001: A Space Odyssey," "The Boys in the Band," "Fantasia," "The Strawberry Statement," "The People Next Door,", "Brotherly Love," "Sunflower," "Dr. Zhivago," "Diary of a Mad Housewife," and "Song of Norway." Spectro Theater movies, dark for the first time in memory of area patrons, will light their screens again within two weeks, owner Maurice Ferris predicted Saturday. Ferris said either he or a new owner from Texas will pump new vitality into the ailing 11-theater, 13 screen chain. Only Spectro houses in Norman and Edmond were functioning Saturday, Ferris said. 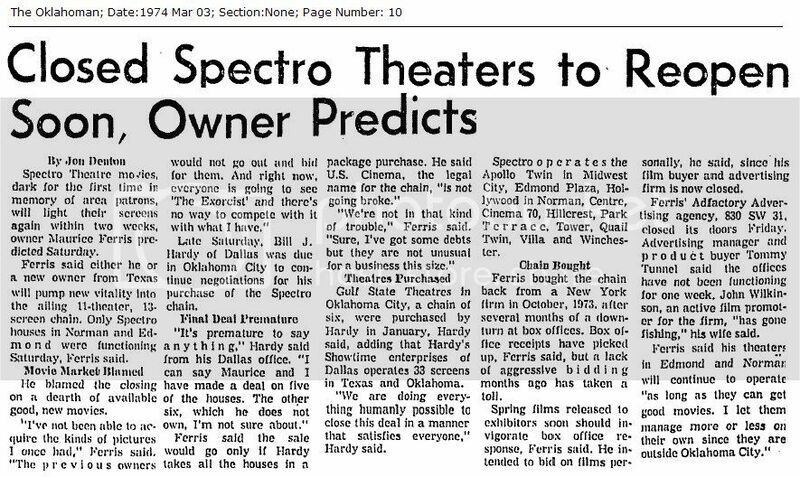 Late Saturday, Bill J. Hardy of Dallas was due in Oklahoma City to continue negotiations for his purchase of the Spectro chain. "It's premature to say anything," Hardy said from his Dallas office. "I can say Maurice and I have made a deal on five of the houses. The other six, which he does not own, I'm not sure about." 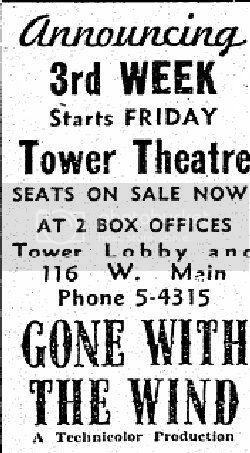 Whether some part of the deal went through or not is not clear from the Oklahoman's archives, but what IS clear is that no Tower Theatre ads appeared in the Oklahoman between early February 1974 until May 1976 — or, at least, I couldn't find any and I looked closely. 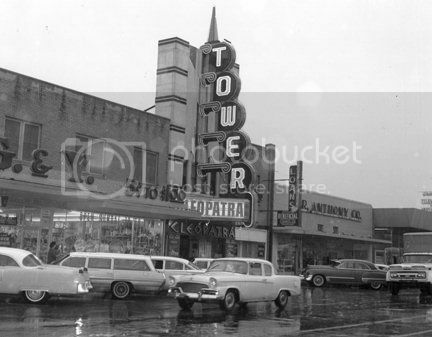 The Tower was not one of the theaters owned by Spectro — although the Tower was leased to others after Farris Shanbour and Charles Shadid ended their operation of the Tower, their ownership of the property was retained. 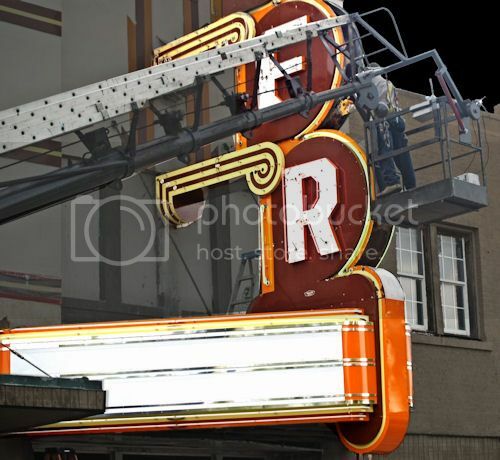 As a side-note, after leasing the Tower and other theaters to Spectro, Farris Shanbour went on to establish several new suburban theaters under the Oklahoma Cinema Theatres, Inc., banner: North Park Cinema 4, MacArthur Park Cinema 4, Heritage Park Cinema III, French Market Twin, the Almonte 6, Heisman Cinema 4 in Norma, and the NW Cinema 70 Drive-in. 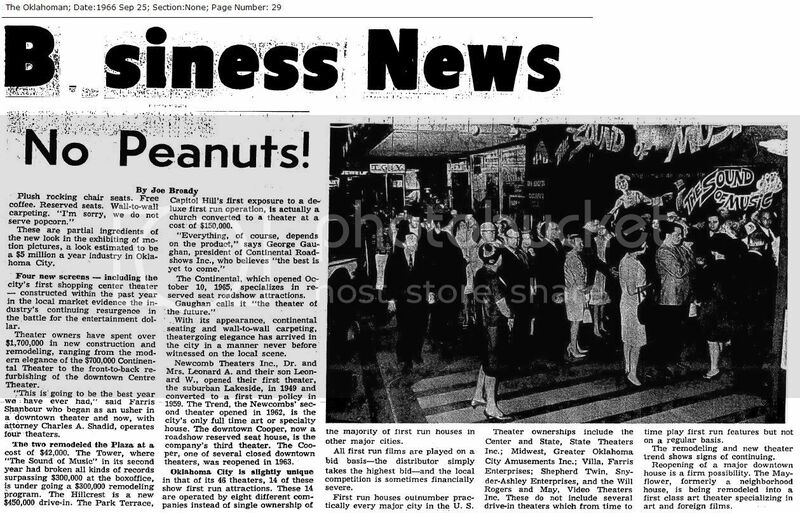 In this December 12, 1971, article, he said, "I just couldn't stay out of the business." 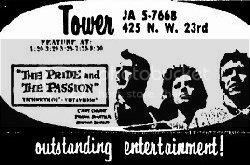 By this May 12, 1976, ad, the Tower reappeared in the ads as part of an unidentified operation which showed the Tower, Park Terrace, South Park, Cinema 4 and Hillcrest Drive In as parts of the group. 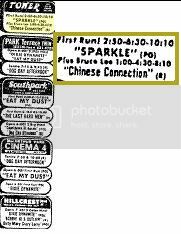 The modest ad showed that "Sparkle" with Bruce Lee was a first run attraction at the Tower. Later Oklahoman articles showed that the group was called "Heritage Theaters" managed by George Grube. That pattern appears to have continued until and ended in July 1979. 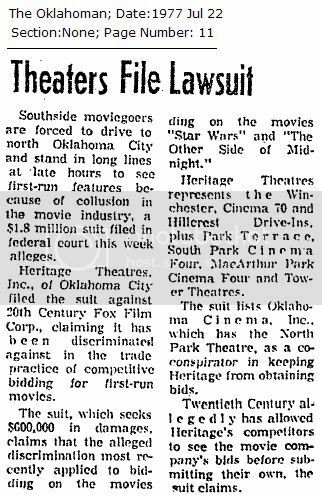 In July 1977, Heritage Theaters filed a federal court lawsuit against 20th Century Fox and Oklahoma Cinema, Inc., owner of the North Park Theater (the corporate principal being Farris Shanbour), claiming that it had been discriminated against in the competitive bidding for first-run movies. The claim was in part based on the allegation that its competitors were allowed to see other bids before making their own. 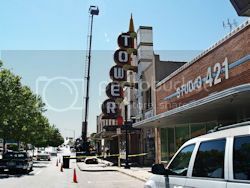 I don't know the outcome of that litigation, but operation of the Tower did not continue in Heritage Theaters hands much longer. 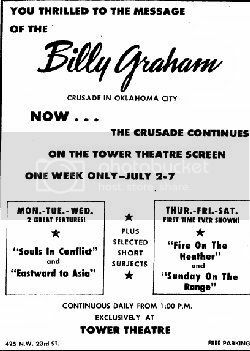 By July 25, 1979, through January 16, 1985, Oklahoman ads appear to show that the Tower was operated by an organization called, "Theatres Inc." I say "appear" since information in the Oklahoman archives is not sufficiently precise to be certain, but, putting together the pieces of available evidence described below, that conclusion appears to be a near certainty. Part of the available objective evidence is the graphic design for movie ads and remembering that movie "group" ads were collectively shown under a collective banner. 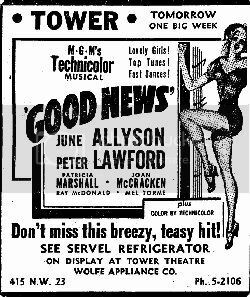 By July 25, 1979, Tower ads began appearing in a picture-frame design standing alone and not as part of a theater group. 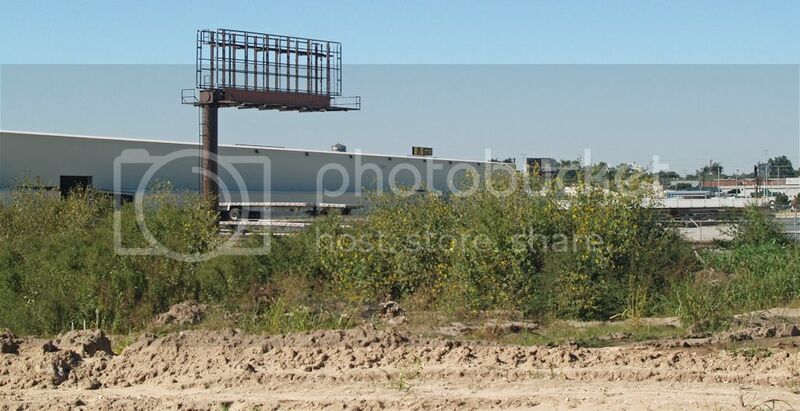 Initially, no attribution to ownership or management was shown in the ads but that changed when the Winchester Drive-In was added to the "picture frame" group following a December 17 ad. A December 31, 1980, ad which included the Winchester gave the name "Theatres Inc." to the group. The identification and frame design continued until September 7, 1983. By September 14, 1983, ad design changed from a picture frame to a box bordered by a column of right-pointed triangles when a new theater, the May Twin, was added to the group. Most often, no management or ownership name was used but on occasion the name "Theatres Inc." continued to appear. 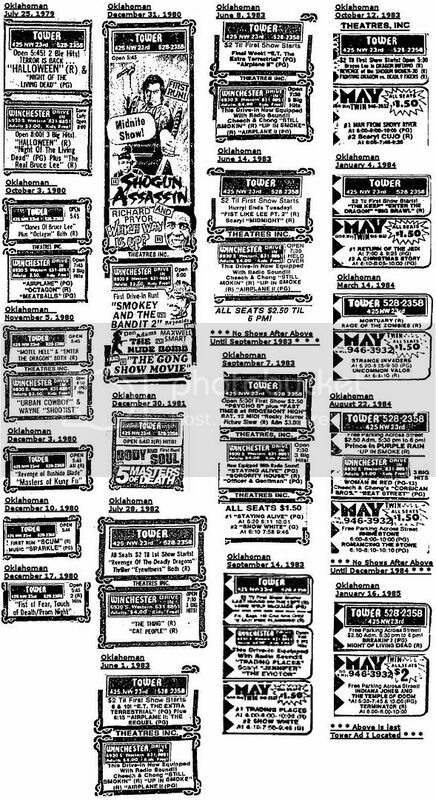 From July 29, 1979 through January 16, 1985, ads were generally continuous, with exceptions. No Tower ads appeared after June 14, 1983, until early September 1983, or after August 22, 1984, until December 1984. The January 16, 1985, ad was the last Tower advertisement that I located for regular movie showings at the theater. To see a collage of ads during the 1979-1985 period, click here. 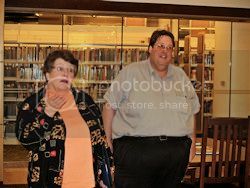 City theater owner George Shanbour has remodeled and reopened the May theater, 1515 N May, under the new name May Twin. The old-style, spacious theater has been halved with two separate screens now available for viewing. Shanbour has been in the Oklahoma city theater business for 25 years and also owns Tower Theater, 425 NW 23, and Winchester Drive-in, 6930 S. Western. 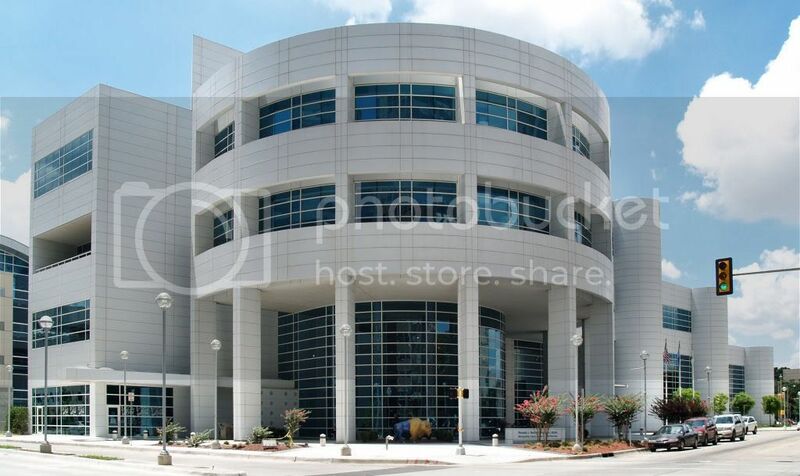 He also leases Plaza Theater, 1725 NW 16. ¶ Except for the drive-in, all are old style theaters, a species almost as rare as the snail darter. 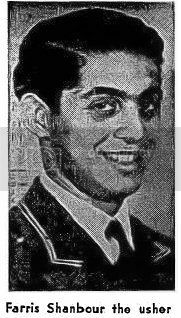 If a logical syllogism has application to answering the question, "Who or what was Theatre, Inc.," judging by this article and other indirect evidence the answer was George Shanbour, brother of Farris Shanbour who steered the Tower through its "2nd Golden Period," Farris having died May 31, 1981. 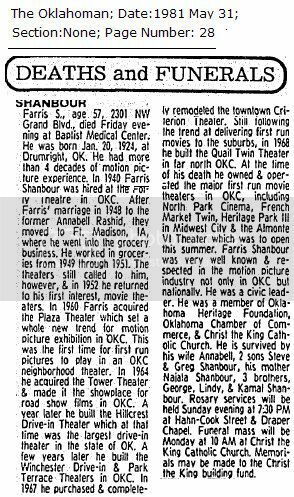 I don't know the particulars, but it is clear that after Farris Shanbour's death the Tower Theatre (and other movie venues) remained in family hands. 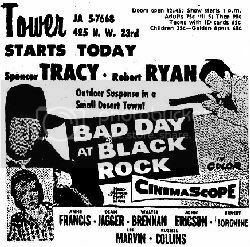 But, the end of the Tower as a theater which showed movies on a regular daily basis was done, just as it had become or was quickly becoming for the other vintage single-screen survivors. 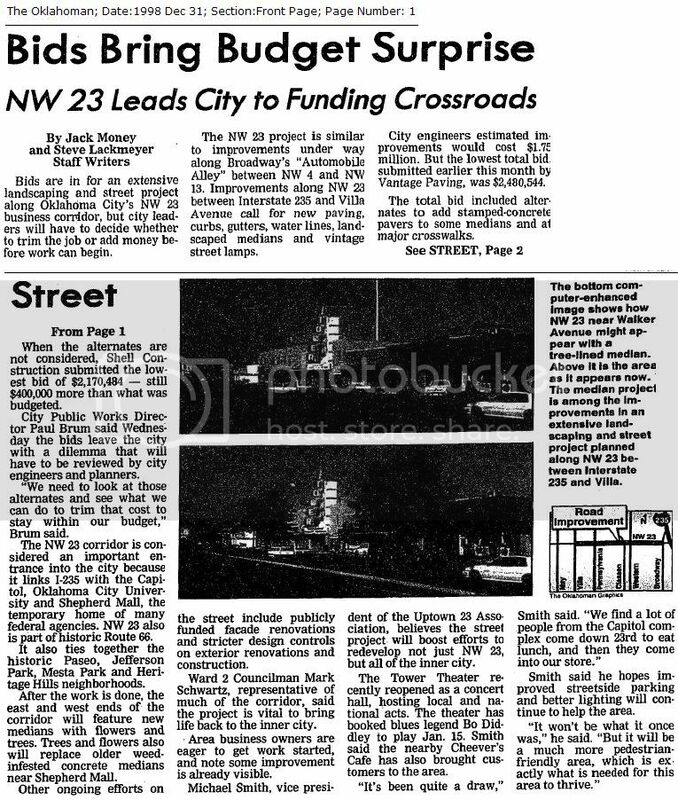 A November 9, 1986, Oklahoman article told the sad, nostalgic story. The graphic from that article appears below. 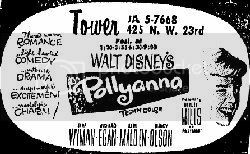 The last regular movie ad that I located for the Tower is the one shown above for January 16, 1985. One of the movies show in the double feature was, appropriately and ironically named, "Night of the Living Dead." DOWN BUT NOT OUT. Oklahoma County Clerk records reflect that the Tower remained in the hands of members of the Shanbour family until November 3, 2005. 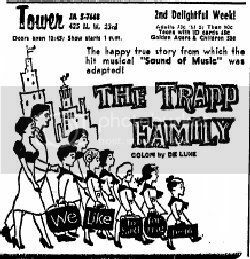 During this period, the family made no further attempts to revive the Tower as a regular movie venue. 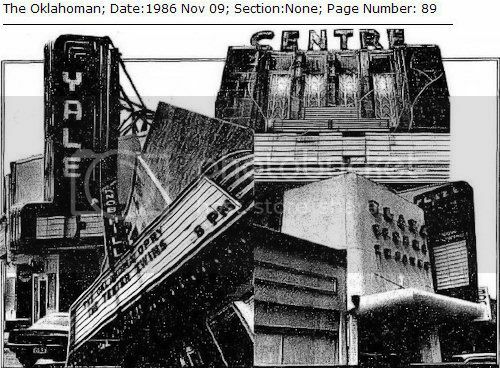 The November 9, 1986, article mentioned above does say that, at the time, the Tower was showing "Spanish-speaking" movies on Wednesdays and Sundays but for how long that happened I don't know. 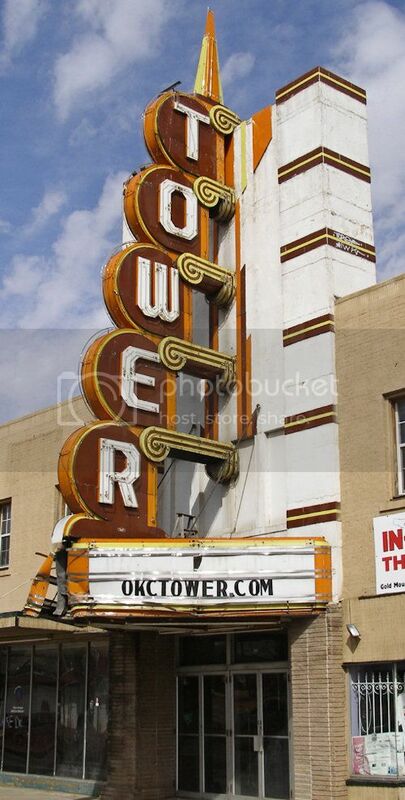 Otherwise, except for one year — January 1999 through January 2000 — the Oklahoman archives are silent as to the Tower as an entertainment venue. But, that single year reflected a period of vitality even if the vitality was different than the movie heritage upon which the Tower was historically based. 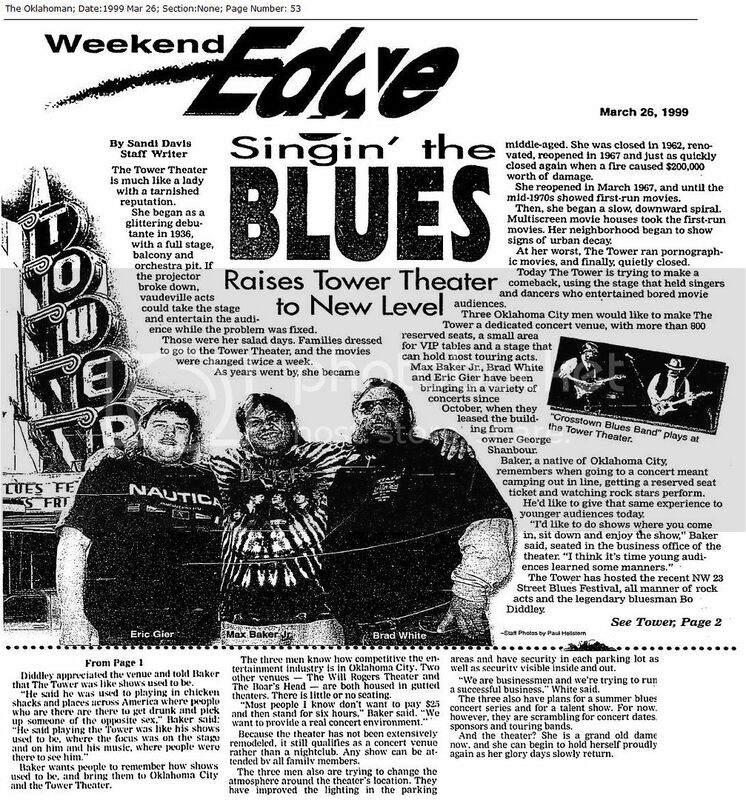 For a twelve-month period of time, it was the Tower's year of music. 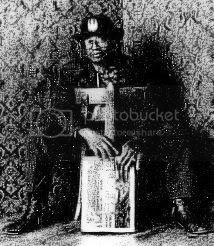 The not-so-great image at the right is a picture of Bo Diddley (whose proper name was Ellas Otha Bates) in a January 10, 1999, Oklahoman article. 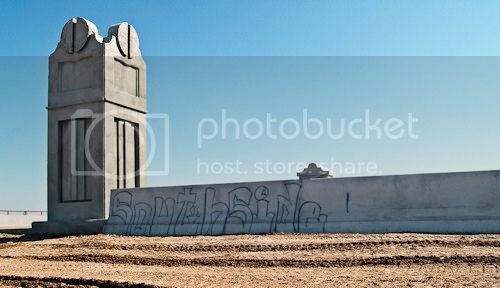 During this 12-month period, about 30 items in the Oklahoman reflect the Tower's serving as a venue for a greater-than-30 live performances by musicians performing at the Tower, usually rock but sometimes blues. 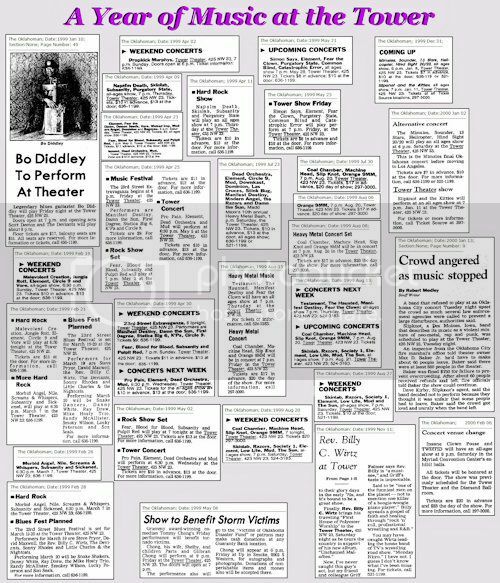 Granted, none of those performing had the status of Mr. Diddley. I've put together a collage of the Oklahoman's notices of upcoming performances and a thumbnail of the collage appears below. Click here or on the thumbnail for a readable version of what the Oklahoman's archives reflect during this period of time. 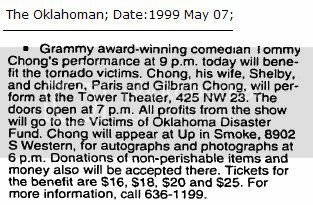 Another name that many will recognize is comedian Tommy Chong's (of "Cheech & Chong" fame) in a May 1999 performance at the Tower. ... but it would not last. 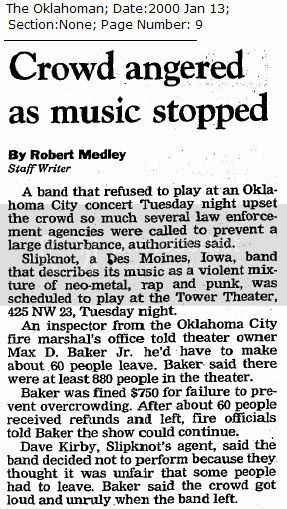 A Des Moines band named, "Slipknot," was the last band scheduled to play at the Tower that I could locate — but, even though a sellout crowd was present, the performance didn't happen. Theater operator (not owner like the article says) Max Baker had oversold the performance, with at least 880 in attendance. The city fire marshal's office required that about 60 leave and that happened. Slipknot was not impressed, thinking it unfair that some had to leave, and decided not to perform, which made the audience not impressed and unruly. See this January 13, 2000, article for a little more. 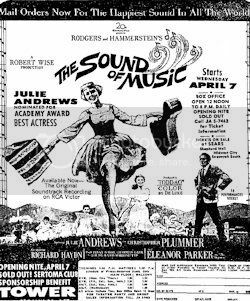 A concert scheduled for February 12, 2000, was canceled and this version of the Tower's sound of music was done. 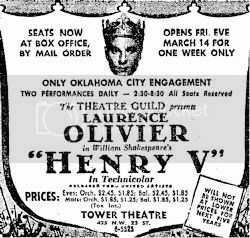 After that, I was unable to locate other events held in the Tower though there may be an ad hoc use here and there which was not picked up by the Oklahoman's on-line search engine. "If that (gold dome) building wasn't there and there was just another brown box at that corner, when you went by you might think you were in Amarillo. There is no reverence or respect for things that are unique — there is a lack of that. That comes with age, education and experience." In that same regard, see this related December 1998 article by Jack Money and Steve Lackmeyer. 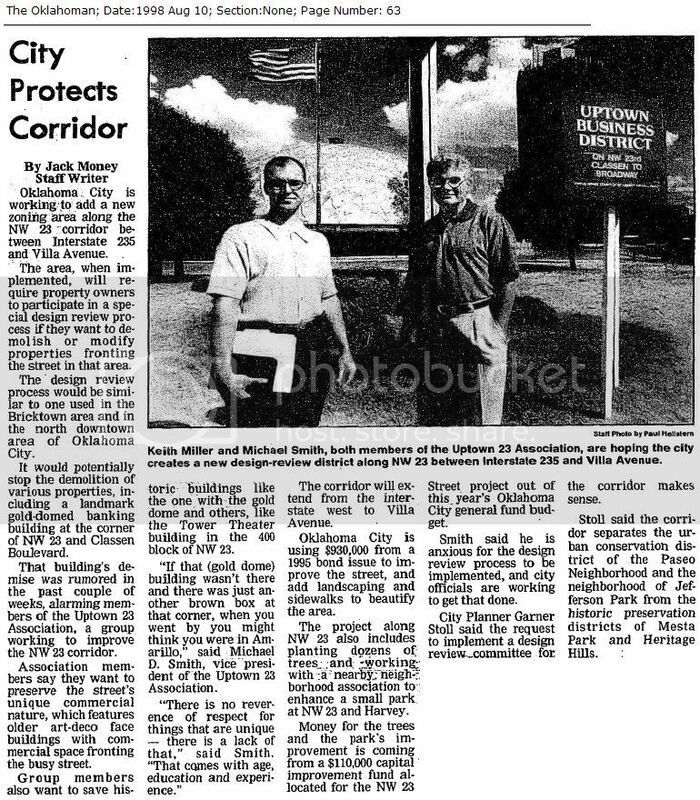 Uptown 23 a 501-C3 business and property owners association formed in 1993 to support the revitalization of an important section of the NW 23rd Street Commercial Corridor between I-235 and Villa Avenue. 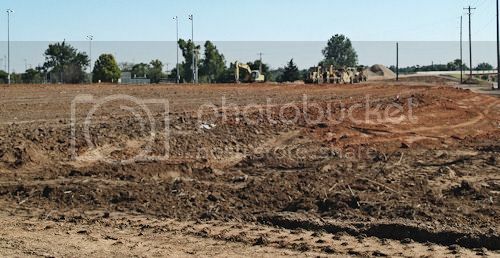 Presently, we are working with the Oklahoma City Planning Department to develop new zoning ordinances for the area which will promote the establishment of new neighborhood commercial businesses, restaurants, services and entertainment venues. 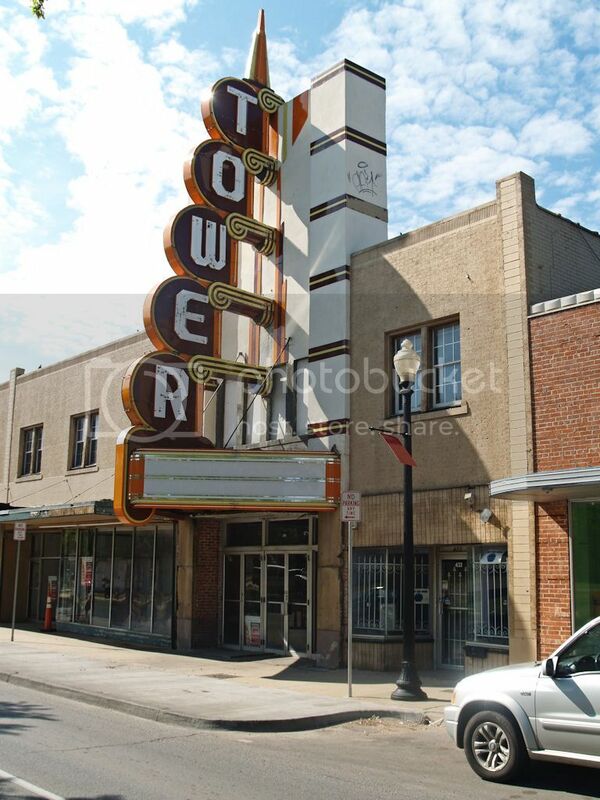 At the top of our list of priorities is the reopening of the historic Tower Theater. We believe that the events and activities of this important multi-purpose venue and its restored landmark marquee will serve as a beacon to energetic entrepreneurs and real estate investors who will in turn provide the driving force for the ongoing revitalization of Oklahoma City's most important street. 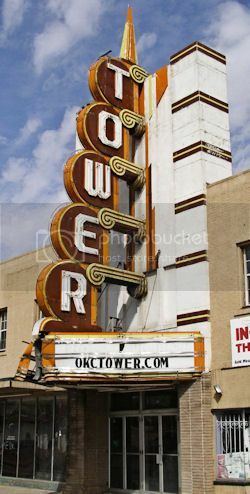 The Tower Theater in uptown OKC - a miracle on 23rd Street? 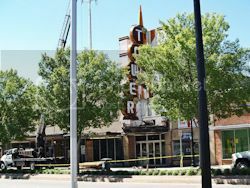 You'll have to forgive Scott Fife and Marty Dillon if they seem like excited kids in a candy store as they show off the badly dilapidated Tower Theater and adjoining storefronts in uptown Oklahoma City. 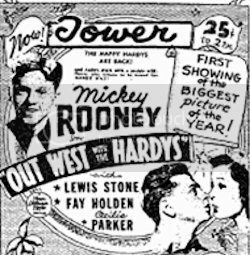 ¶ Although it looks more like a bedraggled damsel in distress rather than the grand dame that once sparkled when it opened during the late 1930s, the Tower Theater at 425 NW 23rd St. has simply stolen the 40-somethings' hearts. Fife, Dillon and their partners, Terri Sadler-Goad and Matt Goad, see the theater with rose-colored glasses and envision a day soon when it will be restored and renewed into a thing of true beauty once again. "I've always liked this place," Dillon recently said as he and Fife used a flashlight to light up the darkened theater. "I played music here in the early 1980s when I was with Wild Youth. I played here at Halloween and they were playing the movie 'Dawn of the Dead.'" 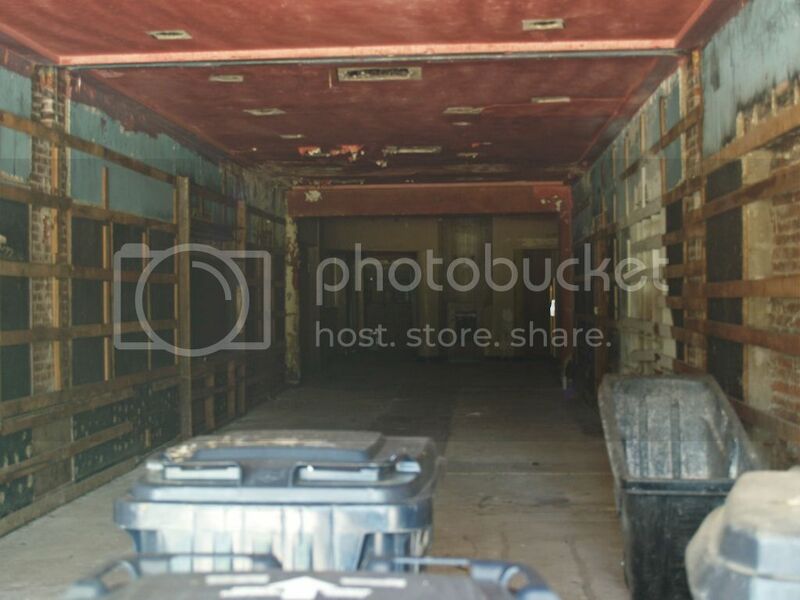 The Tower Theater has been empty for more than five years. ¶ We want to renovate it, but right now we're getting our funding in order, Fife said. We have been approved for state and national historic preservation tax credits. We want to bring the complex back to its original art-deco look through the guidance of the Oklahoma Historical Society. Dillon described a wide array of changes Uptown Development Group and a local architect, Brian Fitzsimmons, hope to make to the facility in order to change into a thriving arts and entertainment destination. 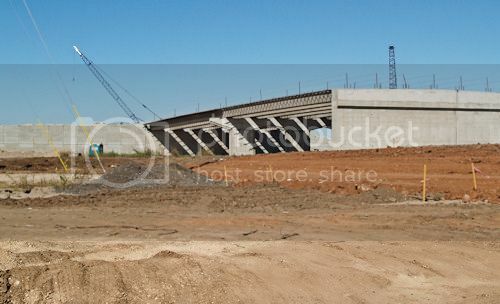 We need a signature concert venue in Oklahoma City, he [Scott Fife] said. ¶ Dillon said the Tower Theater, when restored, will be the right capacity for promoters wanting quality sound because of the great acoustics in the venue. Plans include transforming some of the space into a two-level Irish pub, installing possible skyboxes in the theater and converting the complex into a mix of retail and entertainment spots. 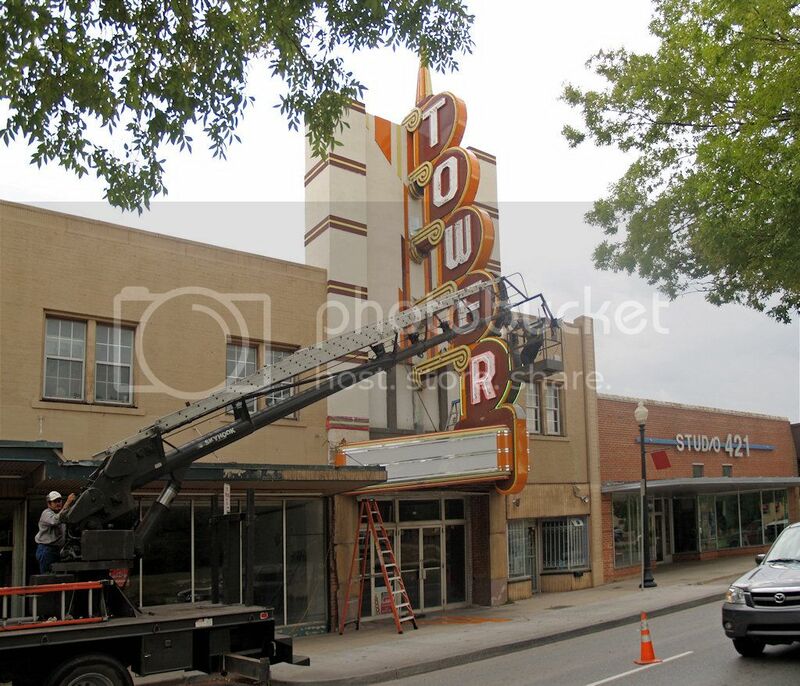 ¶ Fife said the group plans to fix the decaying marquee and believes it will become the calling card for uptown. 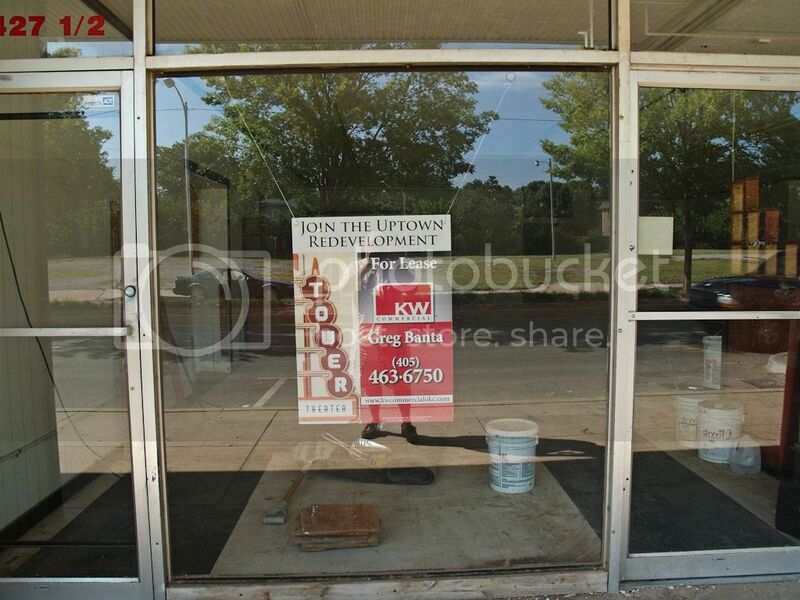 But there's plenty to do before leasing offices or installing restaurants and bars. Fife said the group plans to bring the complex up to fire code, work needs to be done on the roof, air conditioning, the plumbing and electrical system. We're pretty close on funding, Fife said. We believe it will take eight months to renovate the theater. We're also working in an economic empowerment zone and with the area's community action agency. There's a lot of interest from city leaders in what we're doing. Yes, yes, and more yes's! There's plenty of public interest, but the property was purchased almost 4 years ago and it has been more than 3 years since the above Journal Record article was written. 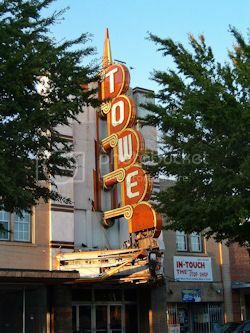 Two years have come and passed since owners of the Tower Theater on NW 23 declared their intentions to bring the iconic property back to life. 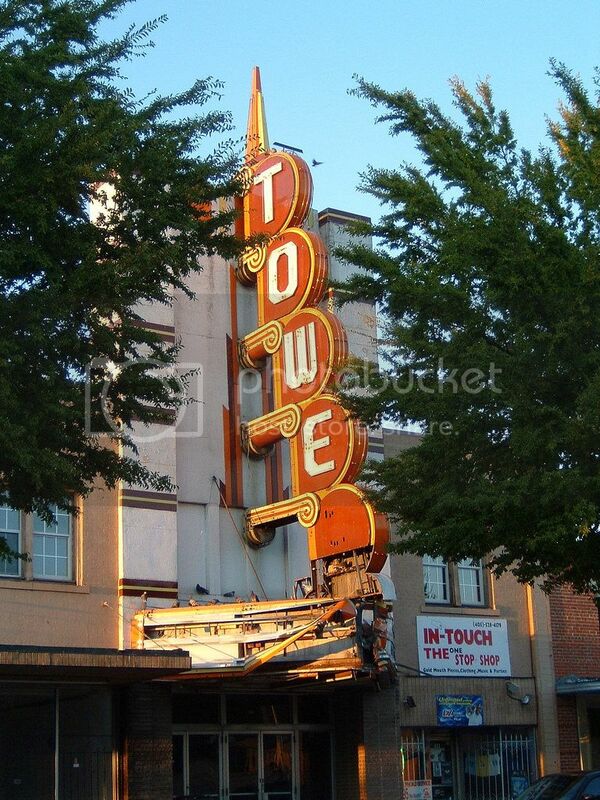 To date, the sign that was once a beacon for the Uptown district remains battered and dark. But don’t assume this deal is dead. Driving along the stretch Monday, I encountered owner Marty Dillon and an old familiar face — Greg Banta. Banta, widely credited for bring life back to nearby Midtown and its landmark, the Plaza Court, is now working as a leasing agent for Dillon and advising on how to best market the property. Some might think the years of delays at the Tower indicate that the project is without hope — after all, isn’t the economy tanking? Naysayers might argue the Tower’s time has come and gone. 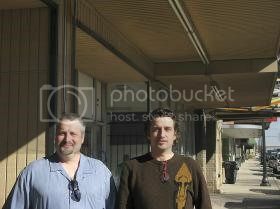 But just an hour before visiting with Dillon and Banta, I visited the Sieber Hotel Apartments in MidTown. The renovation of the dilapidated landmark took a decade to get done. Even after construction was finally under way, the project had naysayers who swore it would never come back to life. 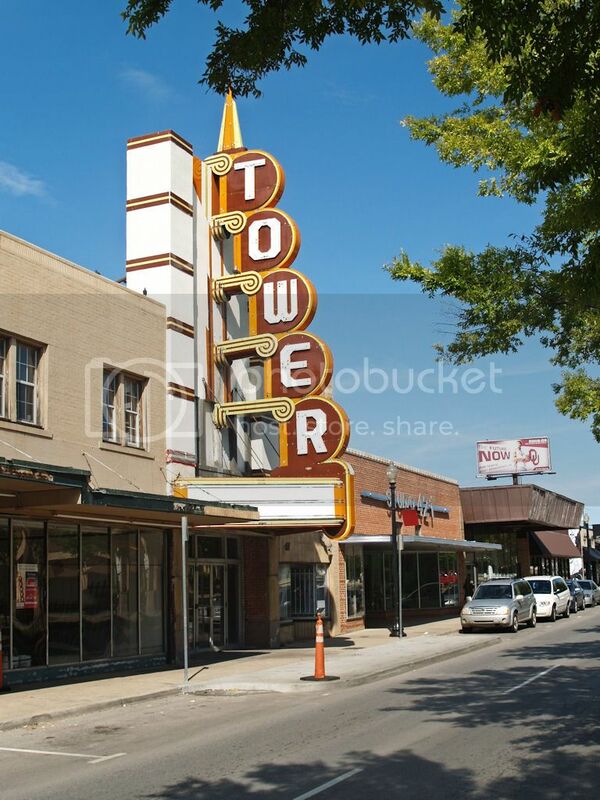 ¶ Consider the Sieber’s rebirth, and then tell me again the Tower Theater is hopeless. I ain't tellin' Steve that 'cause I've got eyes (and a camera) of my own! Living about 4-5 blocks from the Tower, I drive through that area frequently. 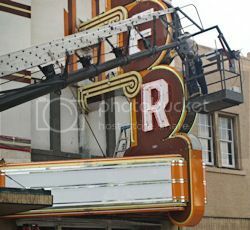 On May 28, 2009, I had my camera in hand and caught what was beginning to happen with the marquee ... the battered part of the signage was being removed ... click images for larger views. 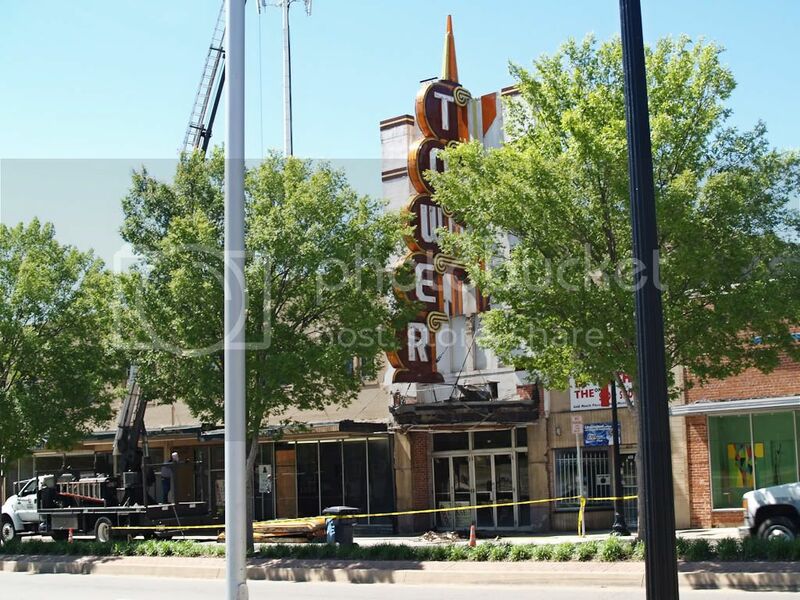 The smashed marquee at the Tower Theater is gone and the letters are back in place — a hint that renovations are finally getting under way at the Uptown landmark. 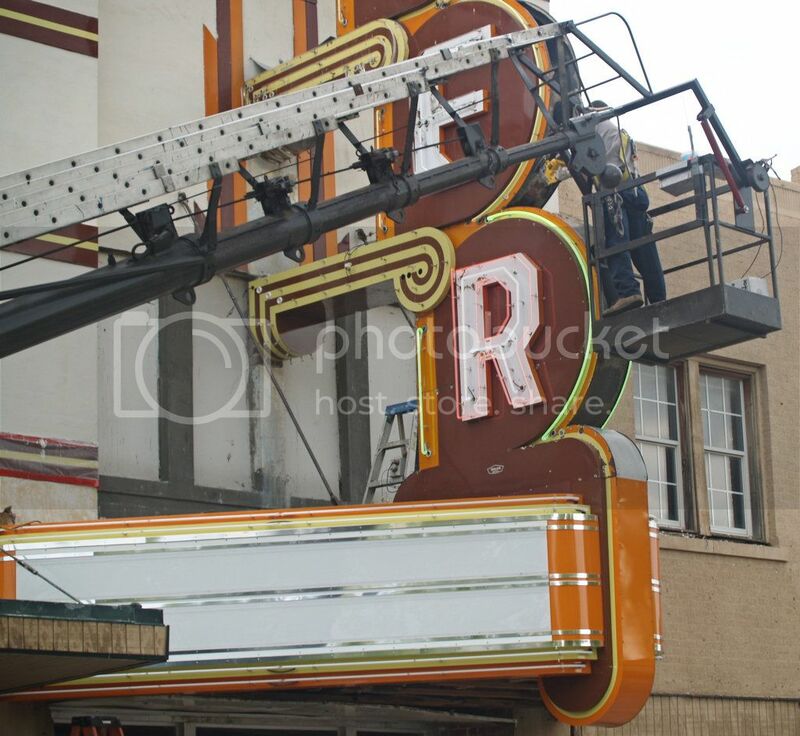 ¶ Owner Marty Dillon said months of delays are over and the marquee will soon return, fully restored. His family's company, Party Galaxy, is preparing to move into 3,000 square feet of renovated space on the second floor of the building at 528 NW 23. "Everybody wants to see progress before they decide anything when it comes to leasing," Dillon said. "I think the sign will be the first step in making that happen." 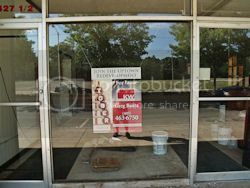 ¶ Dillon said the $2.5 million renovation will include the facade of the theater and adjoining storefronts. Talks, meanwhile, are under way with potential restaurant operators for the first floor. Future use of the former theater space won’t be decided until a restaurant operator is chosen, Dillon said. "If a restaurant operator wants to take on the whole facility, they can lease that, as well as restaurant space," Dillon said. 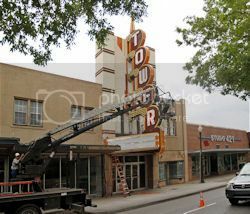 "Or Uptown Development (Dillon's development company) is willing to manage and run the theater space. It can run either way." 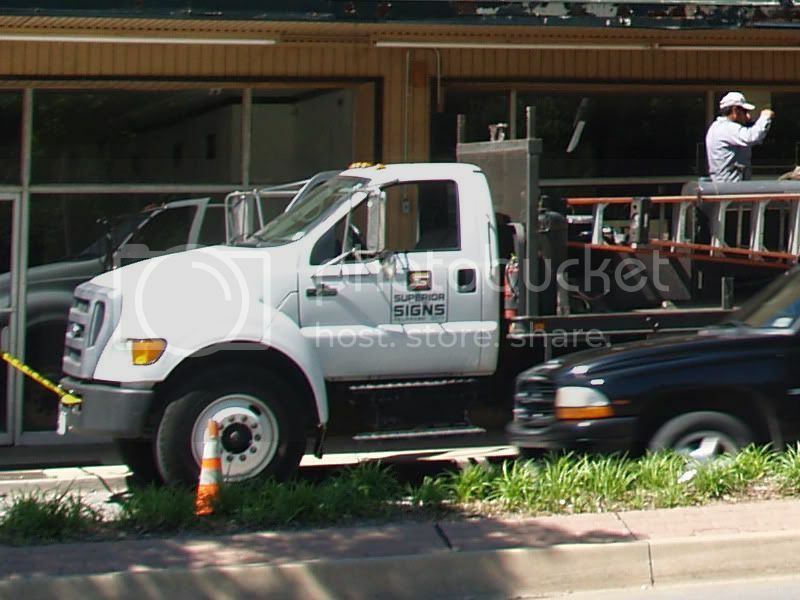 ¶ Dillon is continuing to work with former Mid-Town developer Greg Banta, who admits leasing in the current economy isn’t easy. But he's confident that with successful development at NW 23 and Shartel, where Cuppies and Joe is the neighborhood rage, and continued success at NW 23 and Hudson with Cheevers, the Uptown area's resurgence is in full swing. 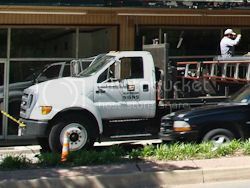 ¶ He notes yet another restaurant, Big Truck Tacos, is scheduled to open this summer in another Dillon property at NW 23 and Dewey, across the street from the Tower Theater. I returned to the site on August 31 and September 9. 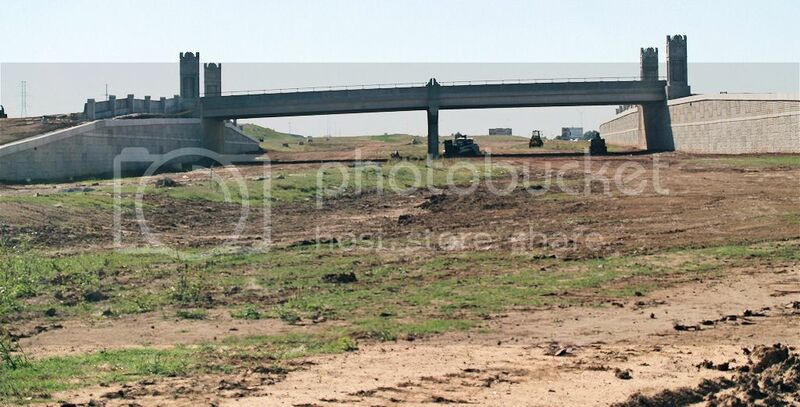 The photos below reflect the changes that I observed ... click on any image for a larger view. 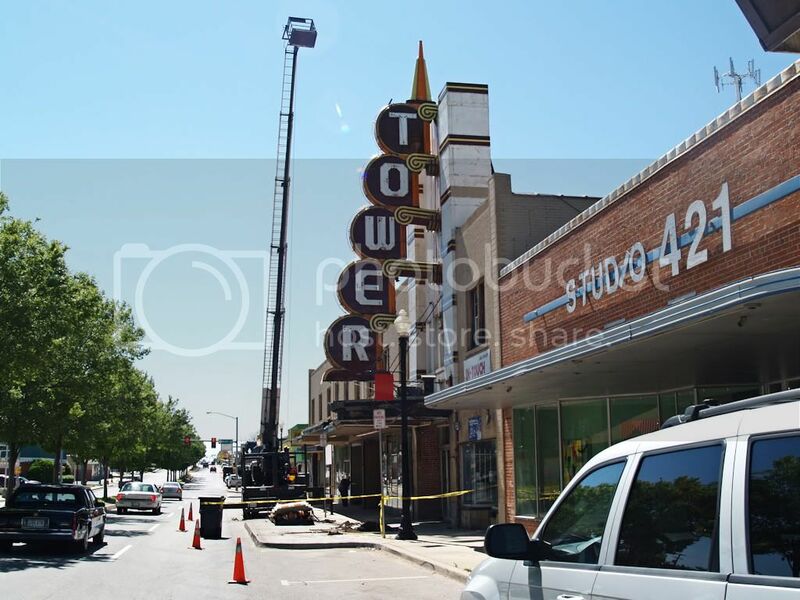 In the August 31 photos, the lower part of the marquee had been repaired and in the September 9 images the neon parts of "Tower" were being juiced up. That's all good, but what I saw only 9-10 days later, on September 9, was better when restored neon got juiced up and the long-dark Tower marquee began to be lit up once again. Is the Tower coming back? You betcha!